The day started off in a much delighted way, then I could expect. A few word about the college. 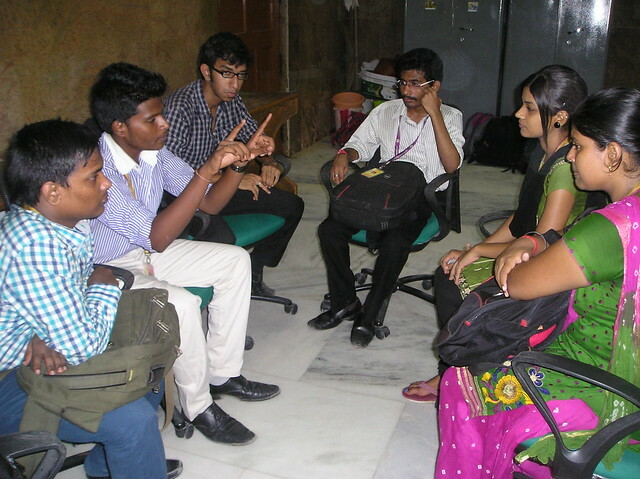 Parisutham Institute of Technology and Science fondly referred to as PITS is a growing institution of excellence. 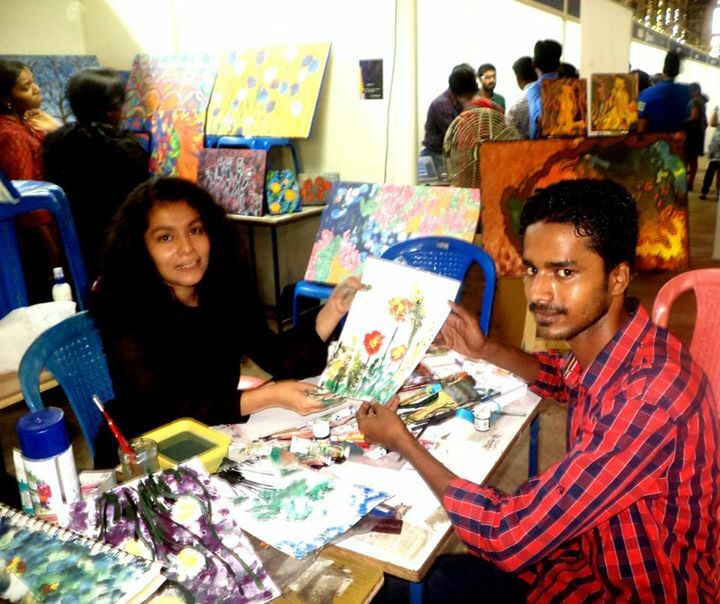 Spread over an area of more than fifty acres, this lush green campus has one of the finest infrastructures in terms of academic environment and facility. 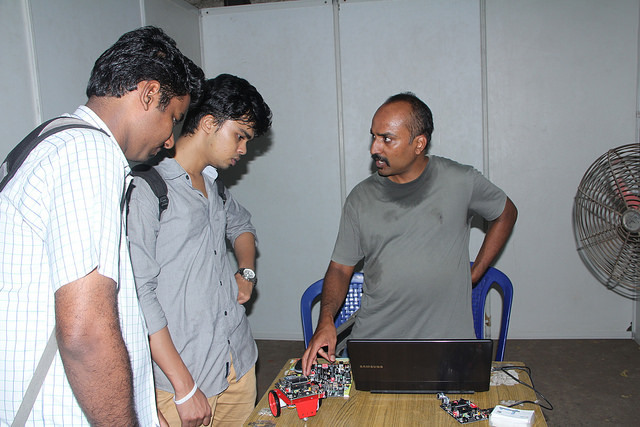 Parisutham Institute of Technology and Science (PITS) is an engineering institution in Thanjavur, Tamil Nadu, India. 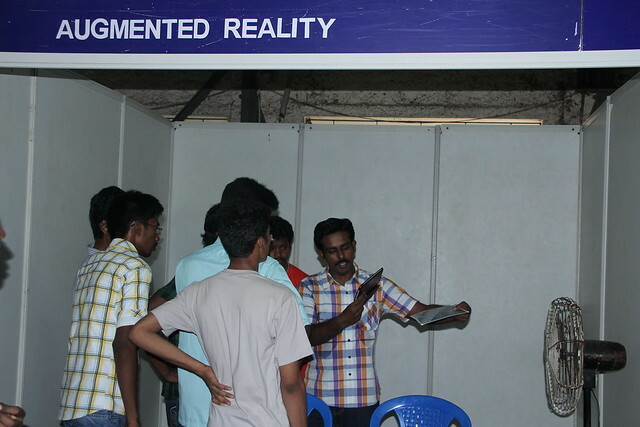 The institution is affiliated to Anna University, Chennai. 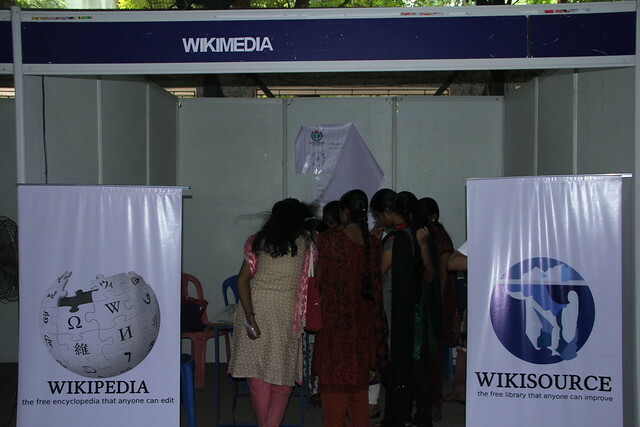 The institution had earlier been affiliated to Anna University of Technology, Tiruchirappalli before the merger in 15 September 2011. 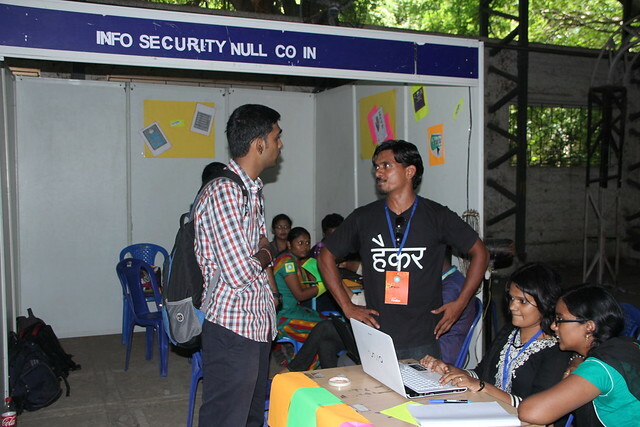 A few days earlier Dinesh – Club Lead of PITS had called me up expressing his interest to contribute to Mozilla and start a club in his college. We had pre-planned everything that was required for the event. 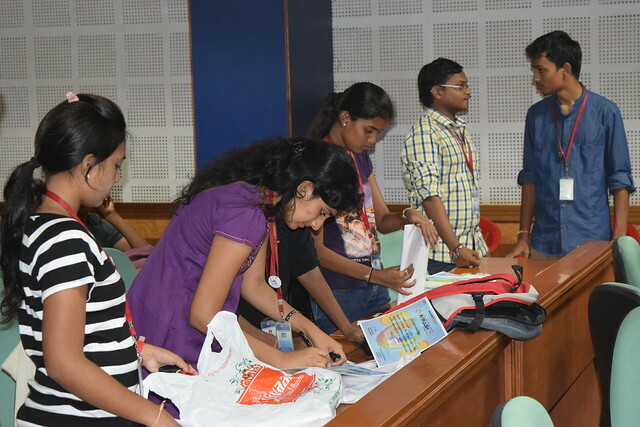 As per the discussion the previous night Dyvik and Myself had put up a checklist consisting of various points that needs to be discussed along with the students. 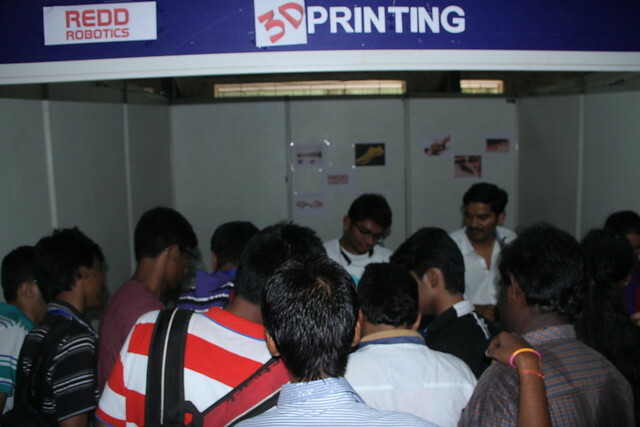 The event kick started at 09:30 AM and I was astonished by seeing a large number of girls than boys. It was really nice having so many WOMOZ up in the club. Just to get the crowd a little warmed up, I started off with the Spectrogram. A real good argument was going on for a while. 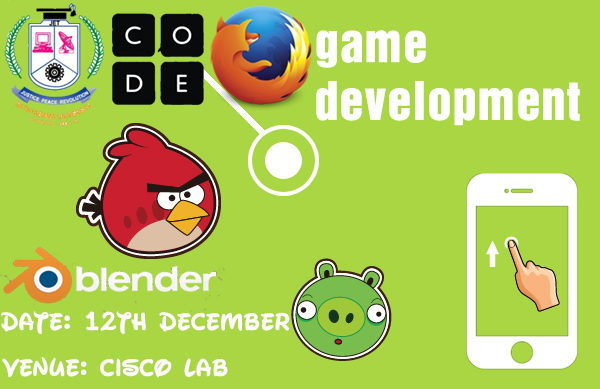 Next I started with the Firefox OS and how one could contribute to Mozilla through code. 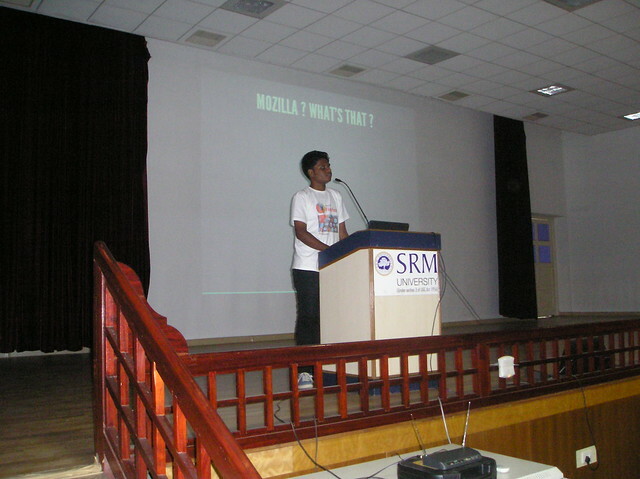 Next I gave a talk on what exactly Mozilla as a community is and the ways in which you could contribute. 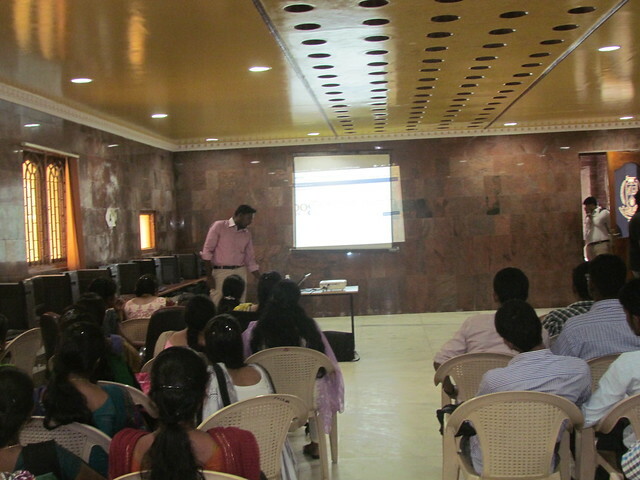 Later I gave a talk on Webmaker and its various tools and also explained them the importance of Web-Literacy. 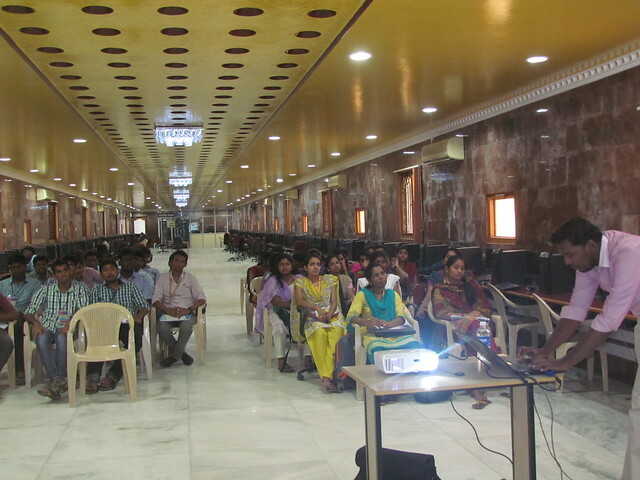 After this I took a session on Appmaker and explained the students about the various building blocks. Everyone loved working with the Appmaker tool since there was less of code and more of design. Later I took a session on SuMo and localization. 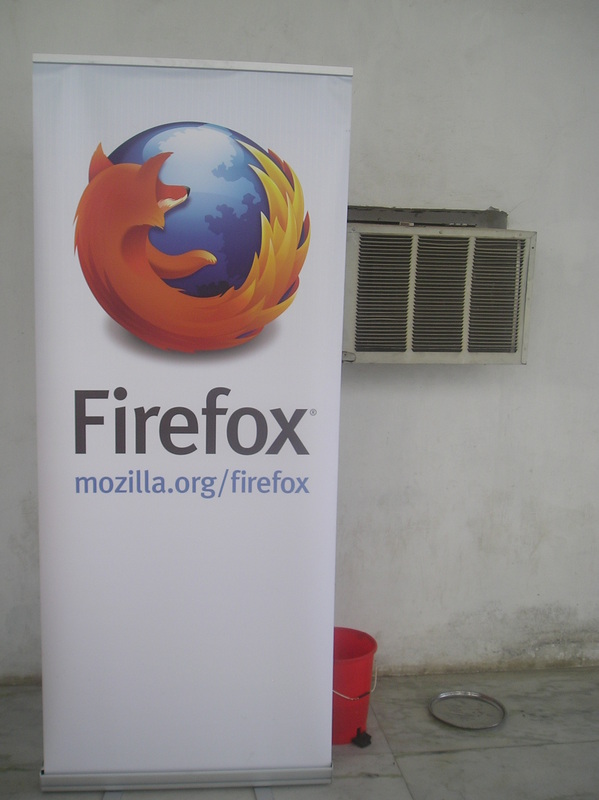 I explained them how they could contribute to Mozilla by helping users out with their problems. And how easy it is to convert something from English to your local language. 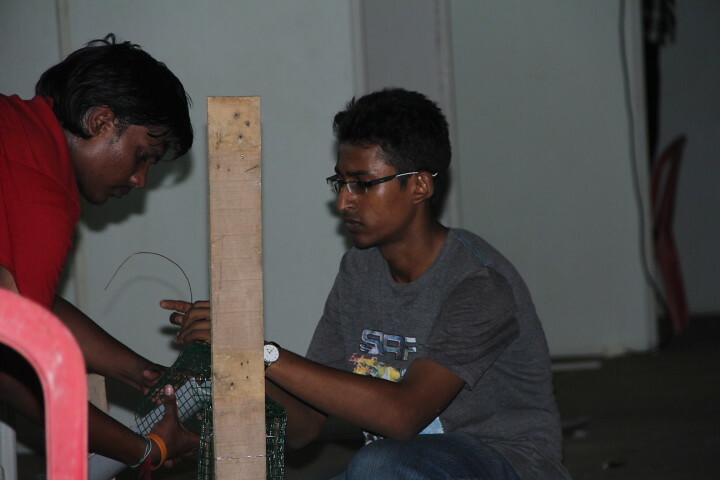 Of course the event wouldn’t have been possible without the constant help of Dyvik and Dinesh. Hats-off to Dinesh and his team for taking up the initiative. 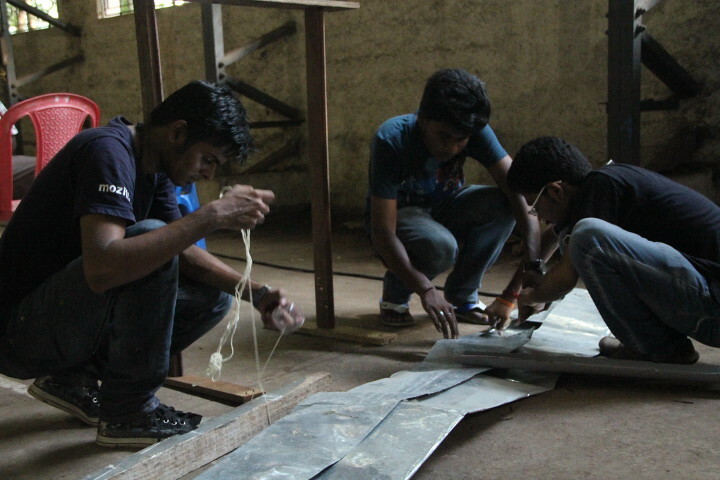 After a week’s tiresome work Subhash, Bharat and Myself(Franklin) were completely exhausted. The entire week passed out so fast as a sway of breeze. 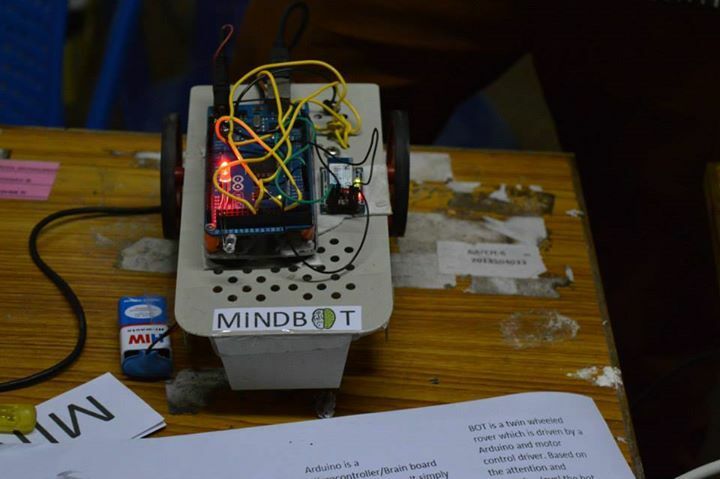 Since this was not the first time that we were organizing an event in our University, we knew how to get along with permissions and other endorsements. Speaking about the Hour Of Code, you might all very well know is a global movement reaching tens of millions of students in 180+ countries. 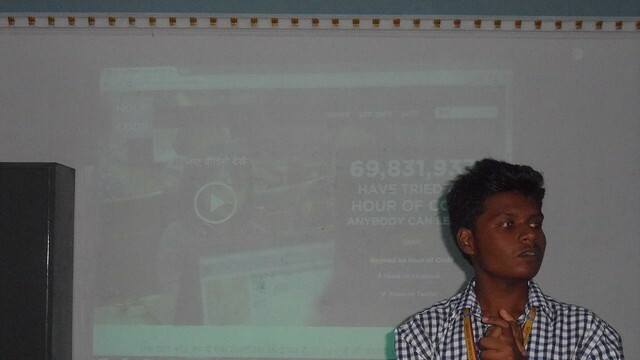 Also, Webmaker is partnering with Code.org on their global Hour of Code campaign. Being the Club Lead in my University, I now had a load of responsibilities over my head. After a week’s planning I came out with an idea along with my team members. 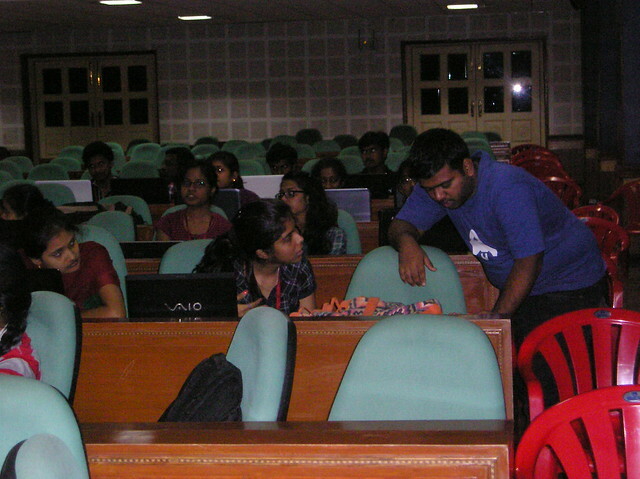 Initially we had decided to teach the 1st year Engineering students about HTML and CSS, later on we changed the plan and thought of doing something different and unusual this time and targeted the 2nd year Engineering students and came out with a plan of teaching them about “Game Development” Yes! you heard it right, game development using one among the best game engines so far. 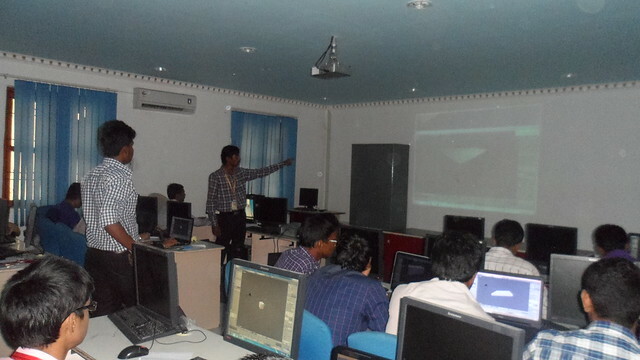 We decided to teach them Game Development using an Open Source Tool called “Blender”. Blender is used by NASA for publicly available 3D models. Many 3D models on NASAs 3D resources page are in a native .blend format. The first large professional project that used Blender was Spider-Man 2, where it was primarily used to create animations and pre-visualizations for the storyboard department. 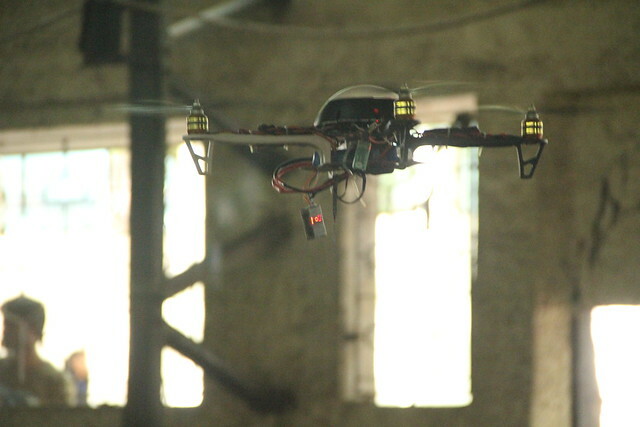 Blender has also been used for shows on the History Channel, alongside many other professional 3D graphics programs. 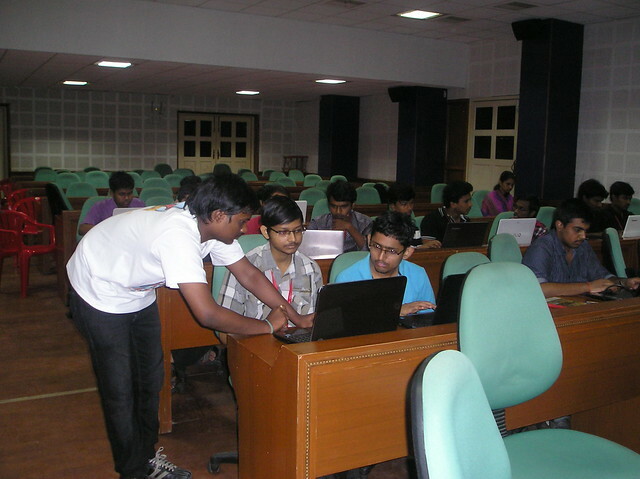 We picked up students from the Computer Science Club of our University and also limited the entries to just 50 students. 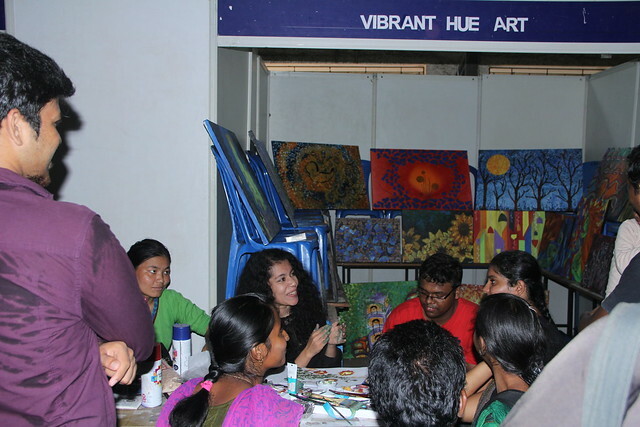 We did not want much of crowd, since lesser the crowd the better we could reach and teach to everyone. 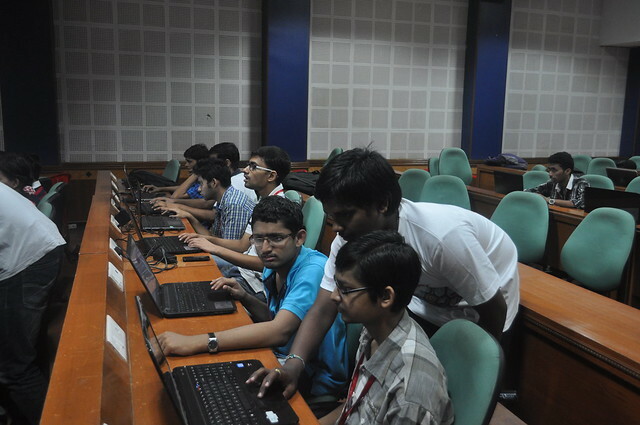 Then we had Subhash, who thought the students about game development using basic blocks available in the following website https://learn.code.org/hoc/1 and created the famous “Angry Birds” game. Next we had Gabriel on stage who started with the basics of Blender. Gabriel has played his hands dirty with this tool for almost a year and has a very good knowledge and passion for this application. 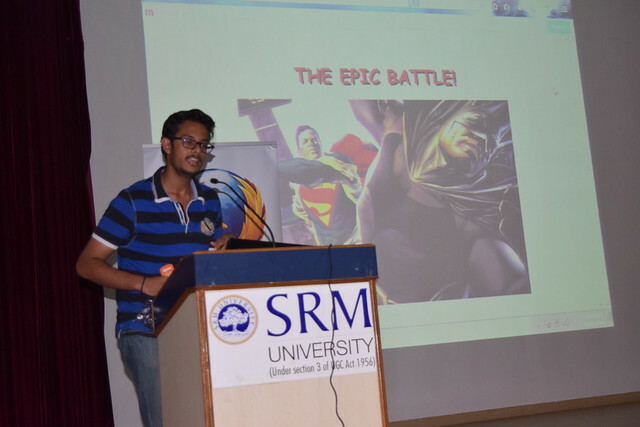 He first started with a brief introduction about game development. He told the students that game development started as early as 1950’s. But those games required mainframe computers and hence weren’t available for the public. Commercial game development started in 1970s. Then he told them about meshes(the objects like characters, buildings, etc used in a game). And thereby he emphasized the fact that, to start game development, one must know how to create meshes. Normally, to develop a game, one creates meshes in a separate software(3d Modeller) and then imports it to a game engine to add controls to the mesh. At this point, he told them about Blender, which can do all things like 3D modeling(creating meshes), animation and also develop a game with its inbuilt game engine. 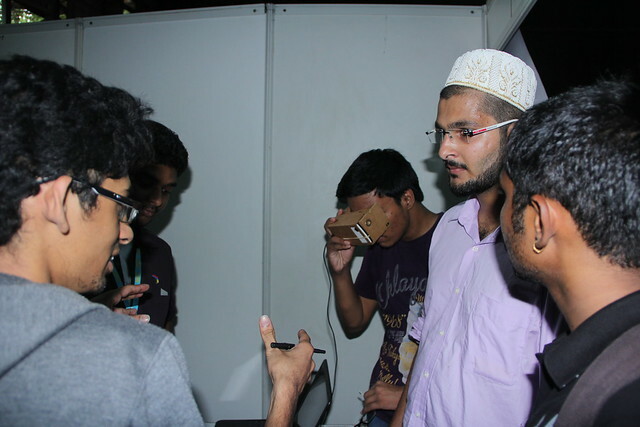 He also taught them about rotating the 3D view itself for a user perspective view and various other predefined views like top view, side view, etc. Then he moved on to some basic animation. 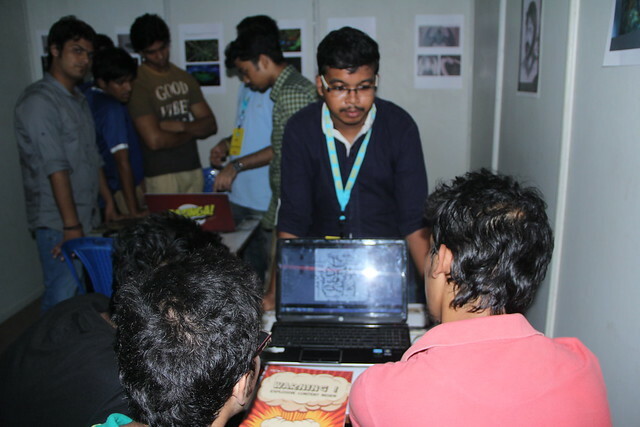 He told them about key framing, which is the most important concept in any animation software. He told them about basic animations like moving an object, rotating an object, etc. 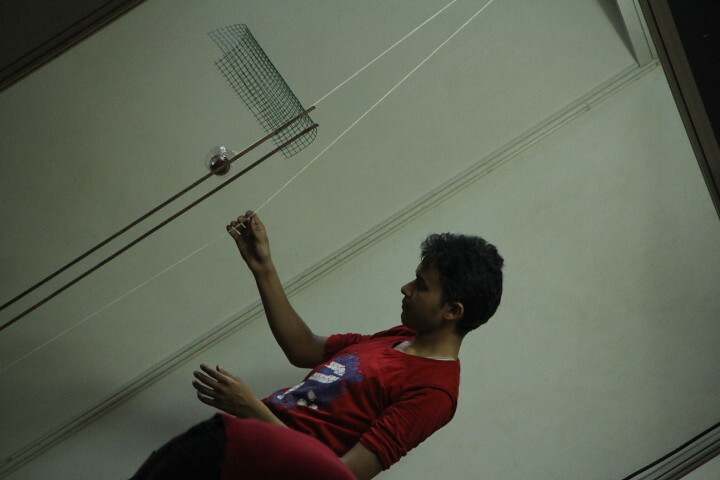 He continued with the basics of physics in a game(like gravity, dynamic movement, static, etc). In blender, games can be created either through logic bricks(predefined game blocks) or a combination of logic bricks and python script. The second way allows the developer to create more flexible games. He taught them about logic bricks, which uses three blocks for every action. These blocks are categorized under Sensors, Controller and Actuator. These blocks when joined together form a piece of code which is executed every time the controller returns true. The controller is basically a logic gate, while it can also be a python code. The sensor detects/senses any action input(eg: key presses, mouse clicks, collision, message, etc). The output sensor block is sent to controller block which results in either a true or false state. 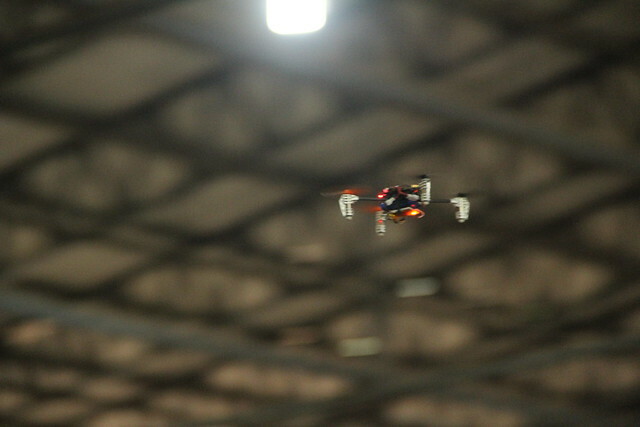 If true, action described in the actuator block will be performed. If false, no action takes place. He then employed this very concept in the “Bounce” game(one among the most played and known games in the early Nokia devices) which he demonstrated, with sensors detecting key presses and through an AND controller to perform a movement action described in the ‘motion’ actuator. After this he added rings to the game environment and taught about how to display score and update it when the ball passes through the ring. 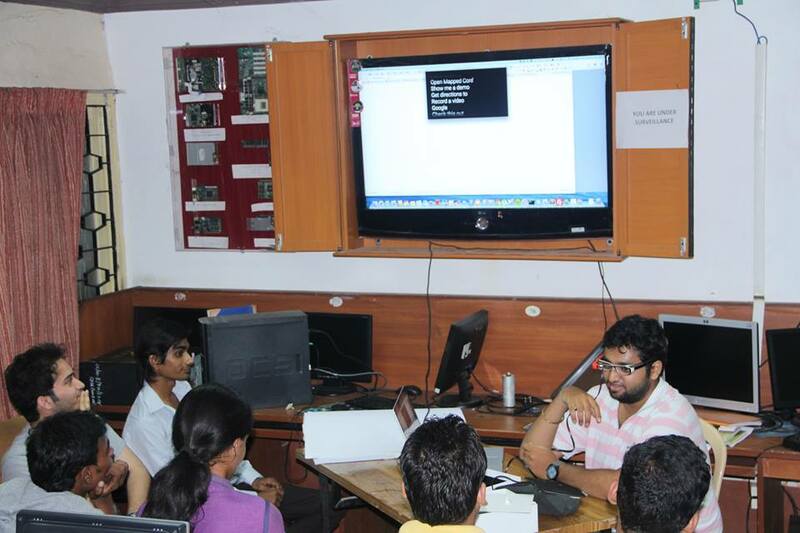 he also demonstrated this using python script. Finally he made a ‘start’ scene and a ‘win’ scene. The ‘start’ scene will be displayed at the start of the game and the win scene, when the score crosses a certain limit. 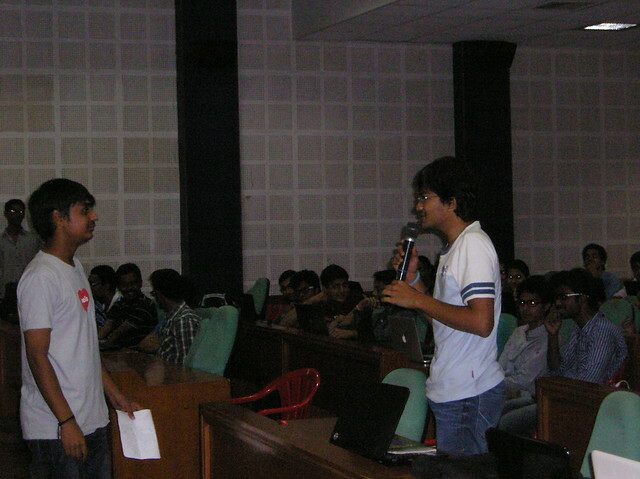 And then to conclude, he told how to create a standalone game application. NOTE: The game is still in it’s early stages of development and is likely to have too many bugs. 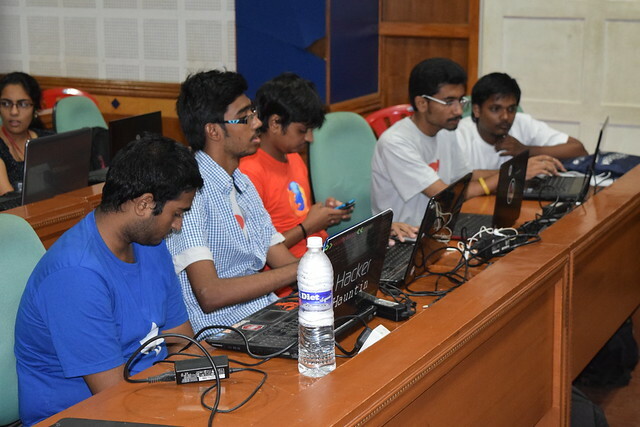 While all this was happening a lot of students had plenty of doubts running inside themselves, they were accompanied and solved concurrently by our Firefox Student Ambassadors namely, Subhash, Bharat, Mounika, Neha, Shefali and Myself. After all this, I then took over the session and explained the students about the Hour Of Code Campaign and why it was important. 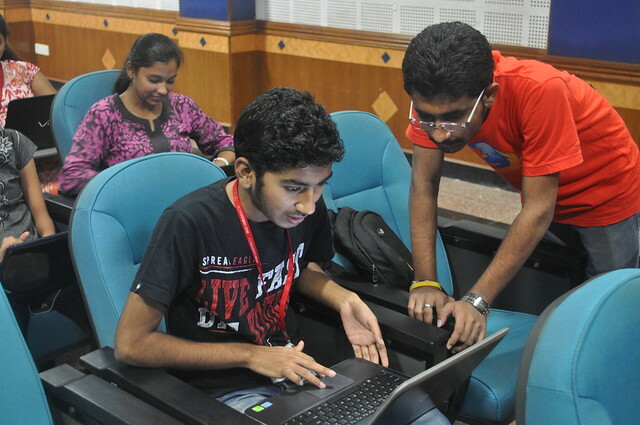 I also stated that the Webmaker had partnered with code.org this time. 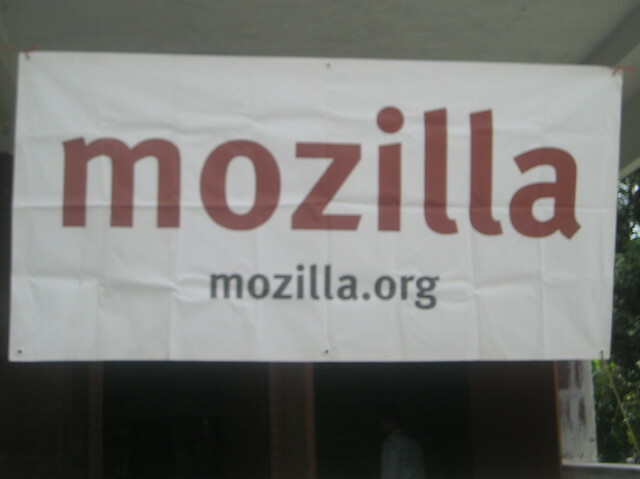 Later I told them about Mozilla and it’s mission. 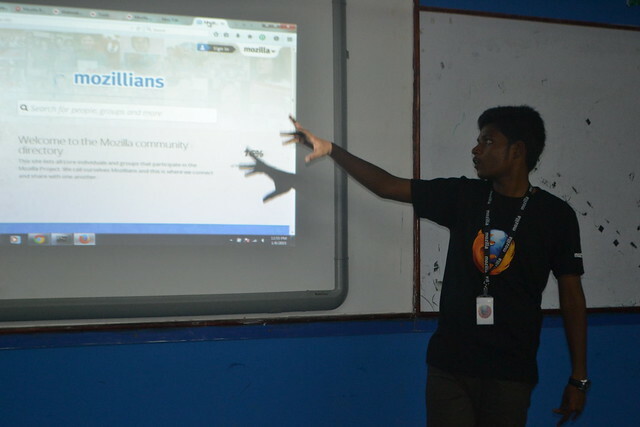 When I started to speak about Mozilla and Firefox Student Ambassadors a lot of students started raising questions on how they could be a part of Mozilla and start contributing to it. 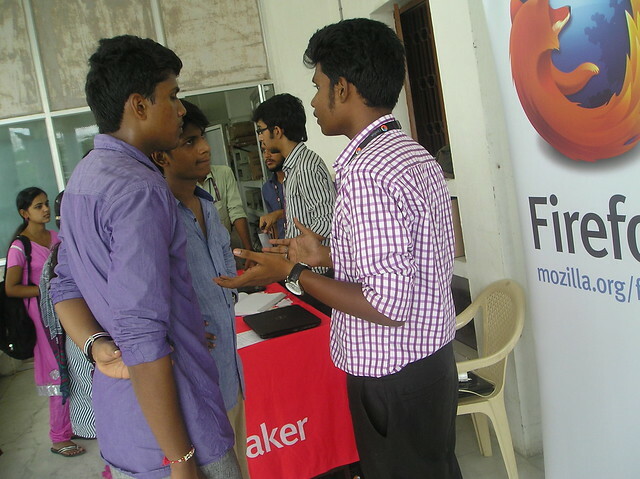 Then I continued explaining them the various Contribution Pathways through which one could start contributing to Mozilla. 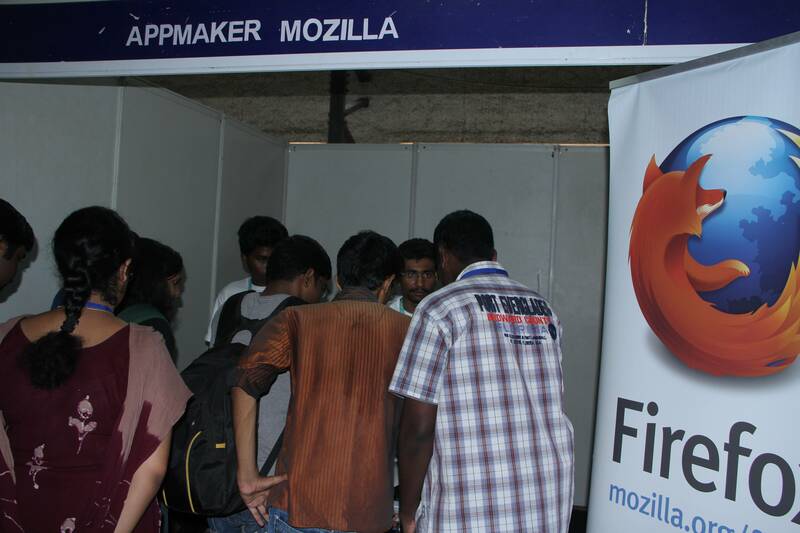 By the time I was about to finish with my session I had a lot of students who were eagerly waiting to sign themselves as Firefox Student Ambassadors. 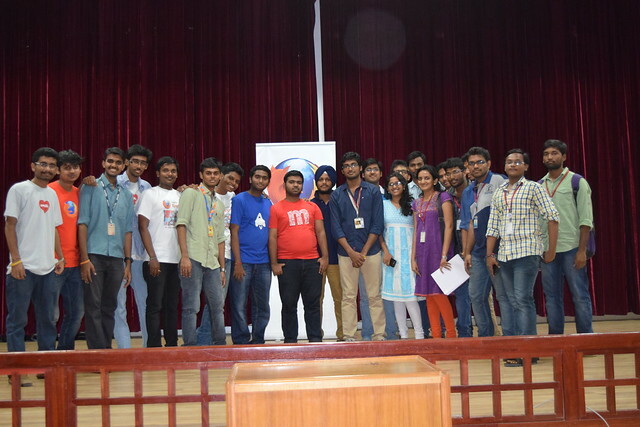 And then the session ends by a group photo. The sun came up over the plain, hot and brilliant, just as it had done since the beginning of time. This day, the first ray of the morning sun fell on an astonishing light. As planned the previous night Subhash, Bharat and Myself reached the University at 9 in the morning and the first thing we had to do was arranging for the venue. Very soon after a lot of up’s and down’s we managed to get a small place in the computer laboratory. The meeting kick started at 12:30 in the noon. 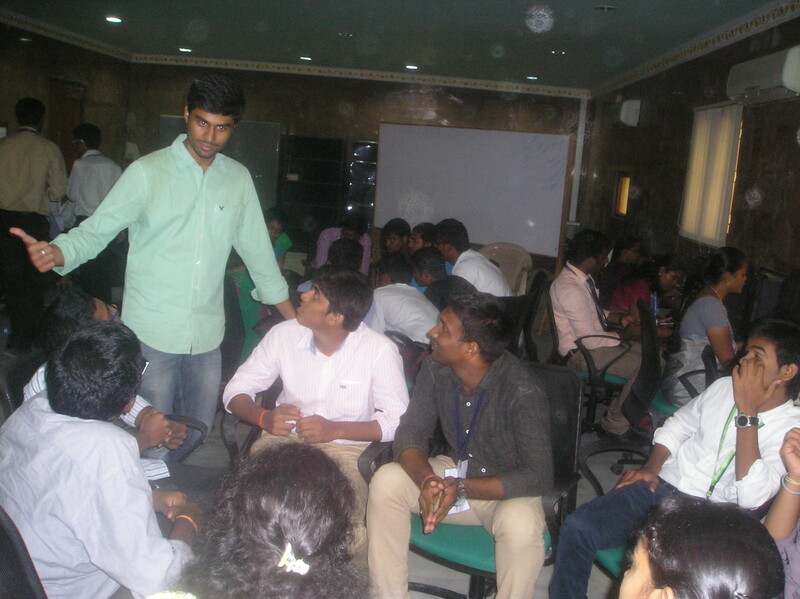 We had our Rep Shreyas Narayanan and Nikhil Patel an expert in Telugu Localization along with us throughout the meeting. We first started by introducing ourselves to each other. 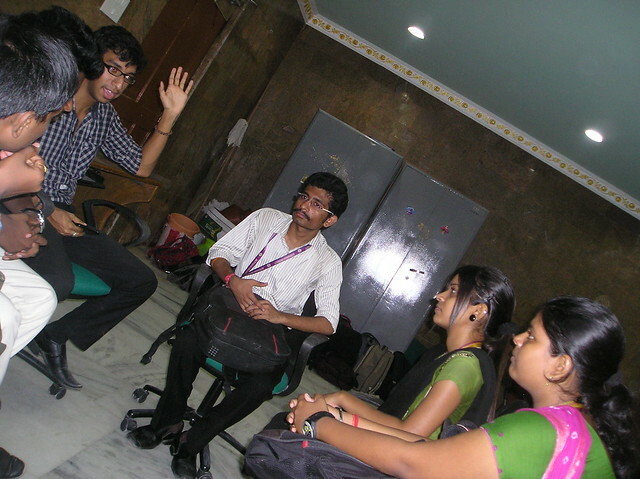 As the motto of today’s meeting was to educate these two volunteers to become active and passionate Firefox Student Ambassadors, Shreyas started explaining them about Mozilla and Mozilla’s mission. 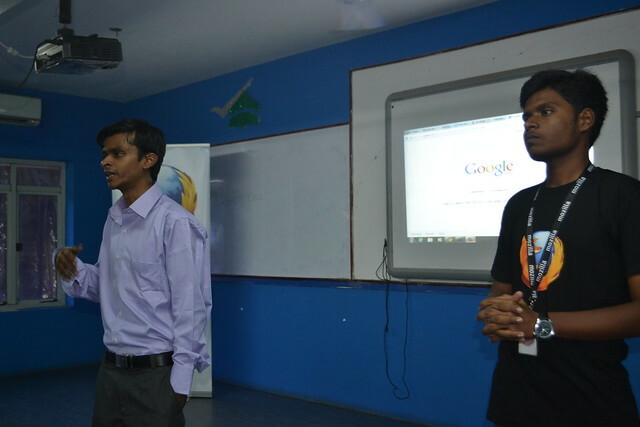 Up next I explained them about the various contribution pathways through which they could contribute to Mozilla. 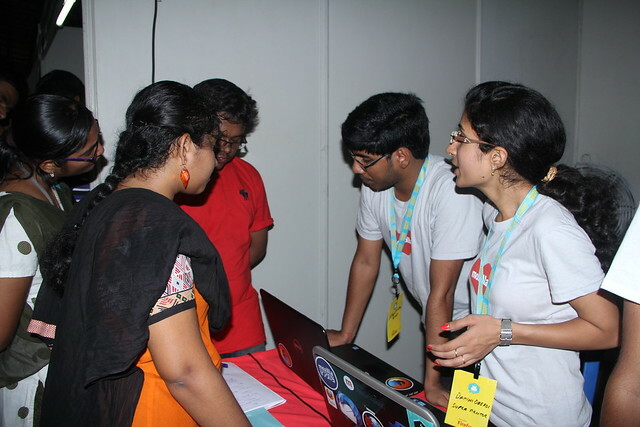 I also told them that for contributing to Mozilla one doesn’t need to be technically sound, you could perhaps try your hands with the non – technical part of Mozilla. 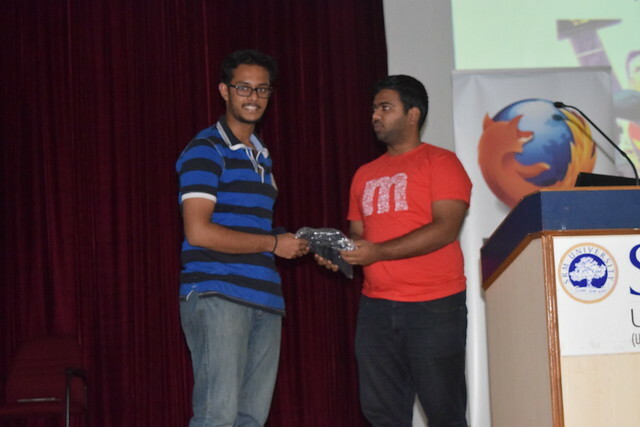 Since they do not belong to the Computer Science Department and are from an Electronic Department background they asked me how could we contribute to Mozilla, for which I asked them a question “Do you use the Internet ? as you both belong to the Electronic Science Department don’t you ever use the Internet ?” for which they replied “Yes we do use the Internet”. So as far as you use the Internet it’s your willingness and responsibility to contribute to the Open Web and also protect it. 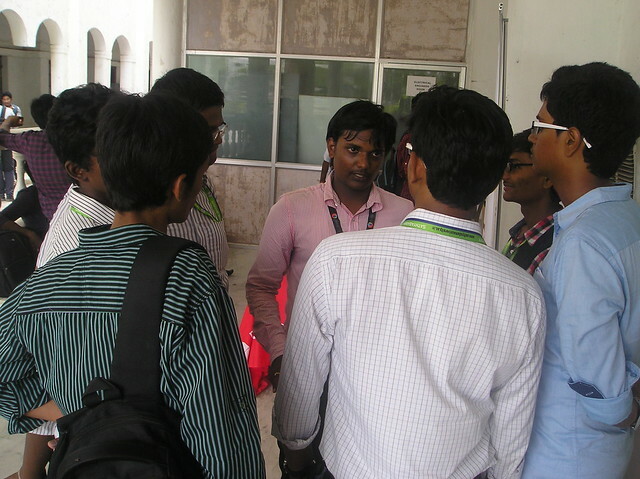 These words sparked a fire in their minds and they were interested to listen to the further talks. 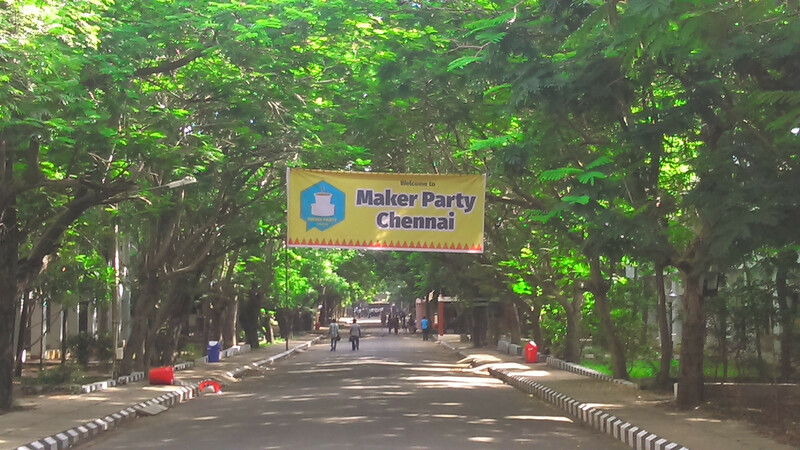 Then I explained them about Maker Party and the motto behind organizing a Maker Party. 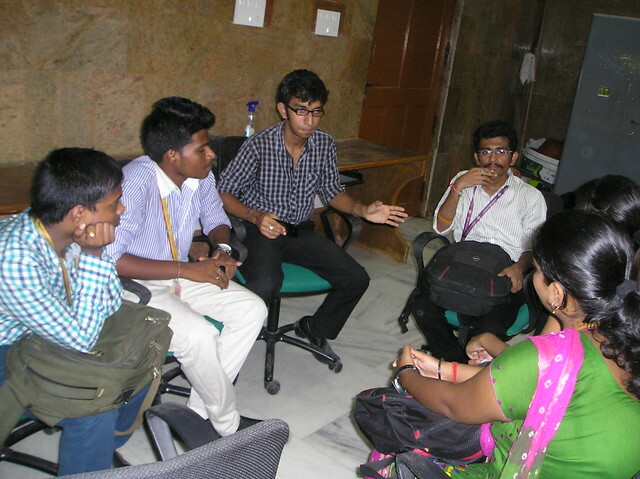 I then explained them about the various Webmaker Tools, Mozilla Developer Network, Army of Awesome, Spread the word, Writing Blogs. Before I continue writing, something you should know about our two new WoMoz Mozillian’s in our family. Well this is completely something which I feel from my part about them. 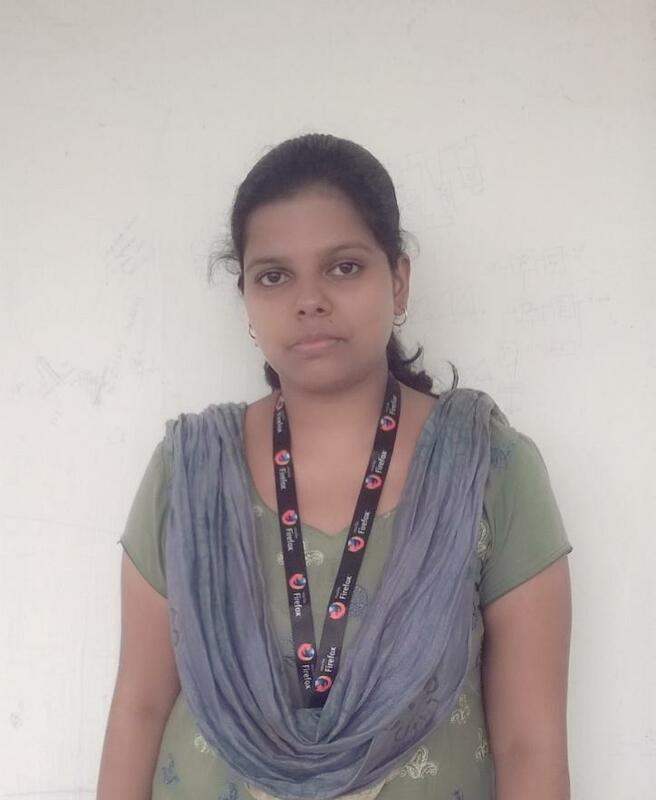 Let me introduce you to Neha Sadhvi, a WoMoz from Sathyabama University Chennai, basically from Patna, India. Studying Electronic and Telecommunication Engineering. 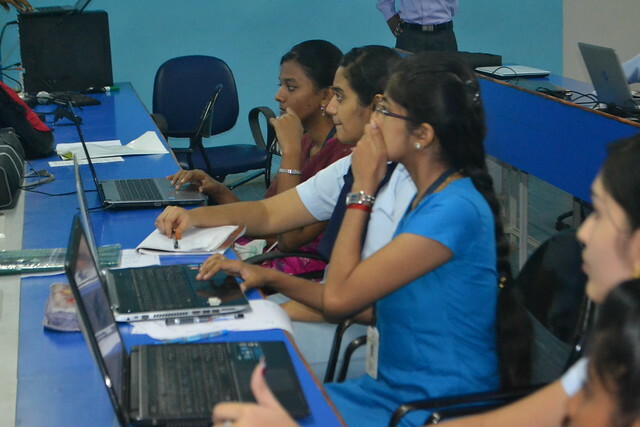 Well this girl is really enthusiastic in learning new concepts and ways through which she could contribute to Mozilla. She has a passion to talk, Yes! you guessed it right she is that talkative. 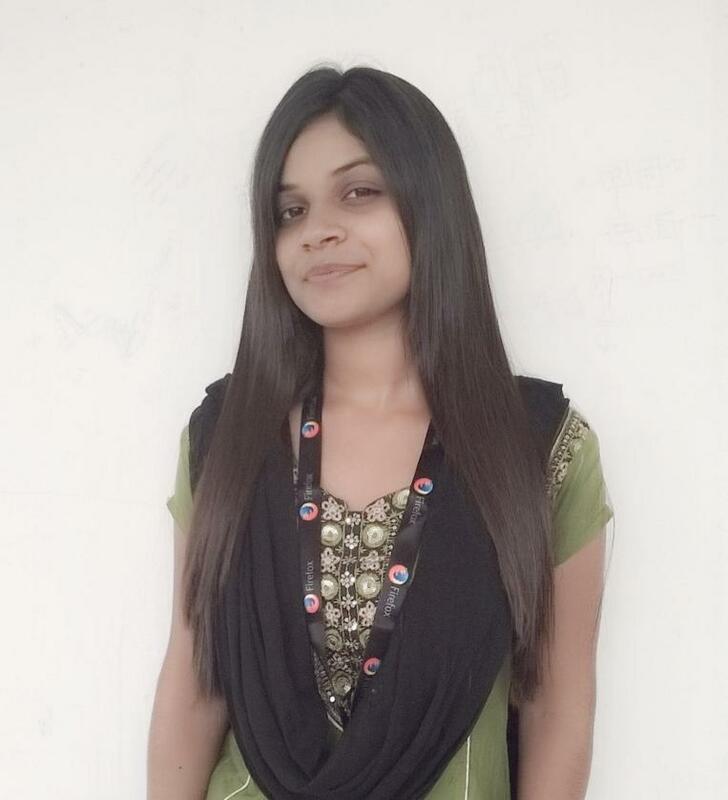 Now, let me introduce you to Shefali Sinha, yet another girl from Sathyabama University Chennai, basically from Saharsa, India. 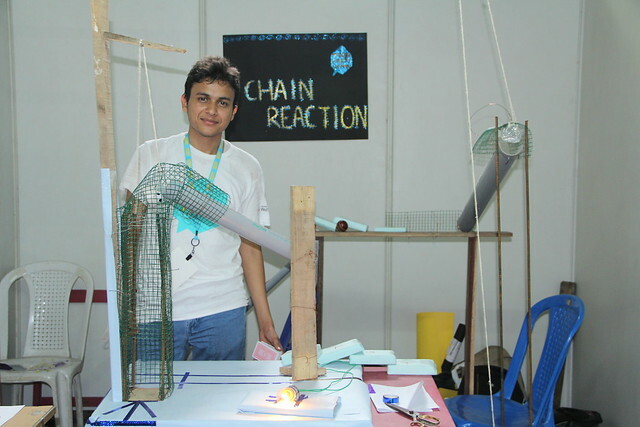 Studying Electronic and Telecommunication Engineering. She is a girl who always thinks about future. So when we met her for the first time, all that she asked me was “When are you guys planning for the next event ?” She was keen in knowing the various pathways of contribution. 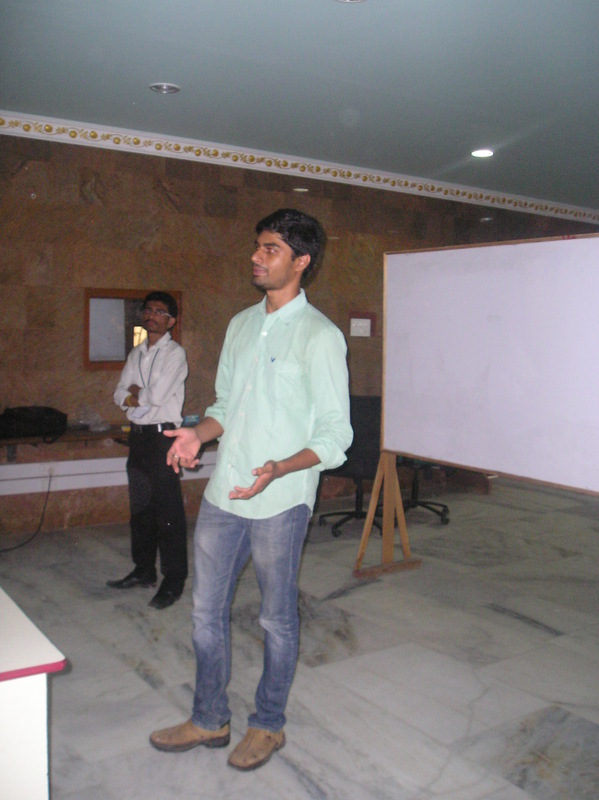 Then next Nikhil Patel explained them about Localization and how things work and are to be done. 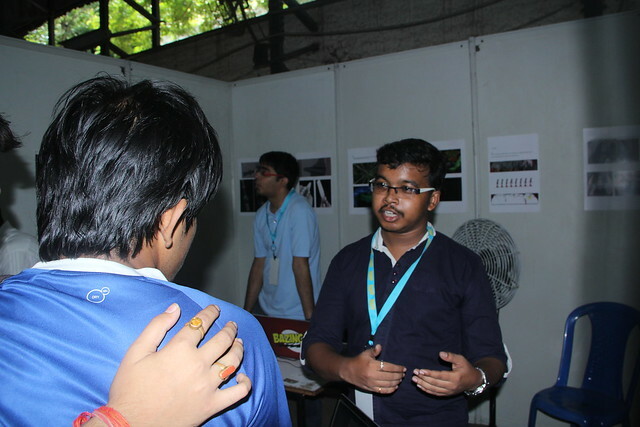 Nikhil also told them why Localization is important and how it makes others life easier. 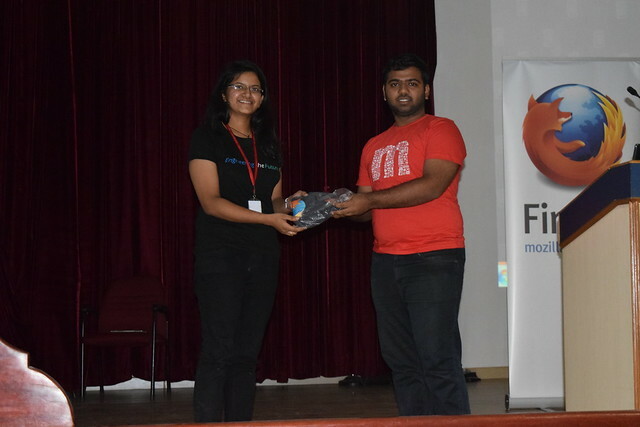 After this, a very good question was raised by one among the two FSA’s “What’s the difference between Mozilla’s Firefox and Google’s Android, both are Open Source ?” A very well answer was thrown out by Shreyas, which really convinced them a lot and also me. 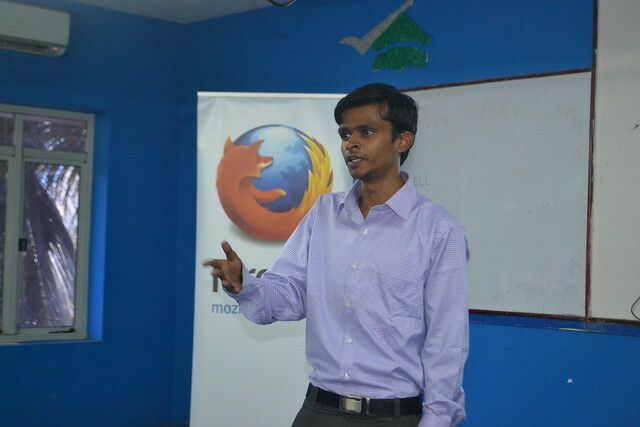 He also explained them about the structure of hierarchy in Mozilla. 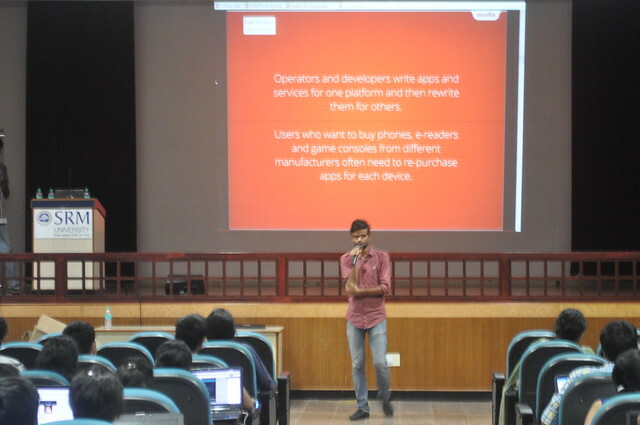 Then Subhash (FSA) explained them about Appmaker in detail and how the building blocks work and are connected with each other. 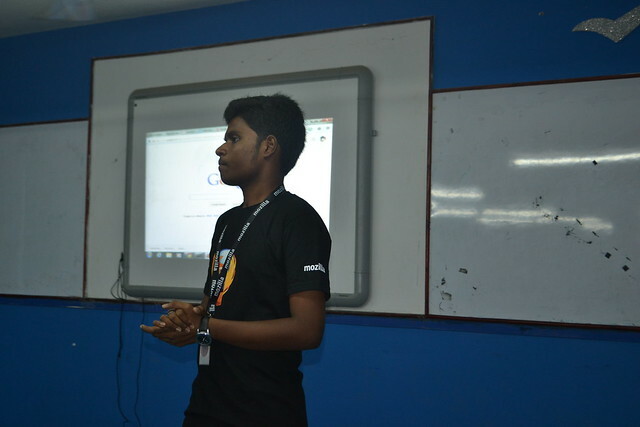 He also shared with them his life experience being a Mozillian, and also the talents he learnt after joining Mozilla as a volunteer. 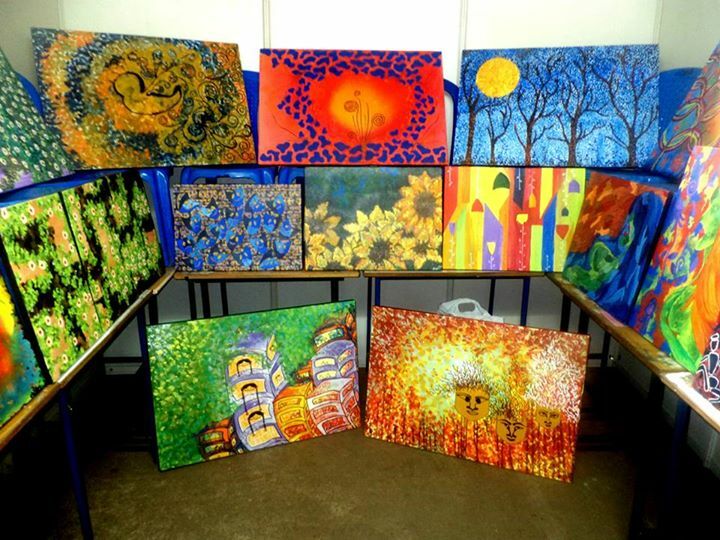 This is something which really made them feel good and they were inspired by his words and thoughts. He also told them about the past events that we conducted as a team and the fun we have in planning and executing each and every event. 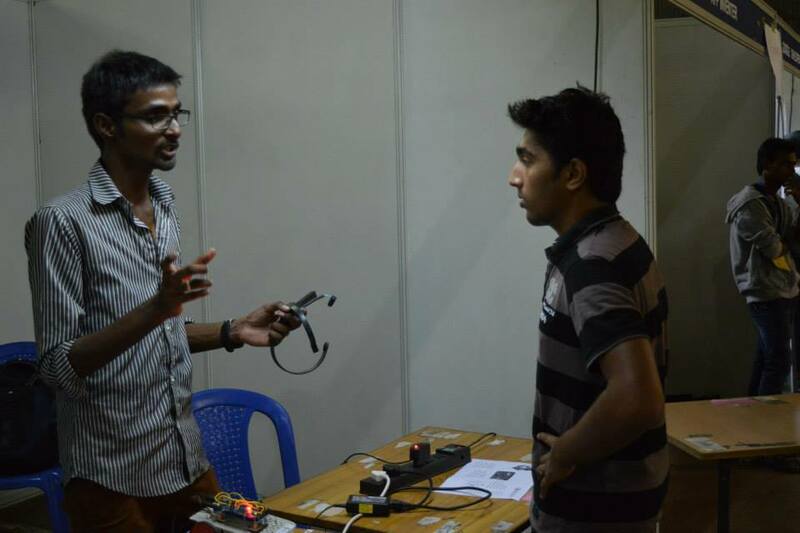 He also briefed them about Maker Party and the effort we took to make it a huge success. 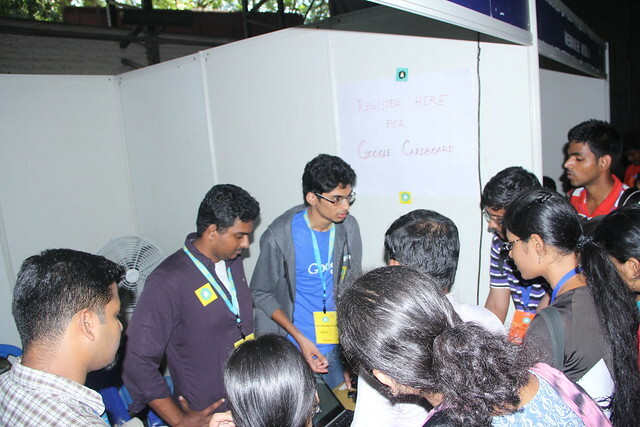 All these made them more interested and fascinated towards joining and working as a team. 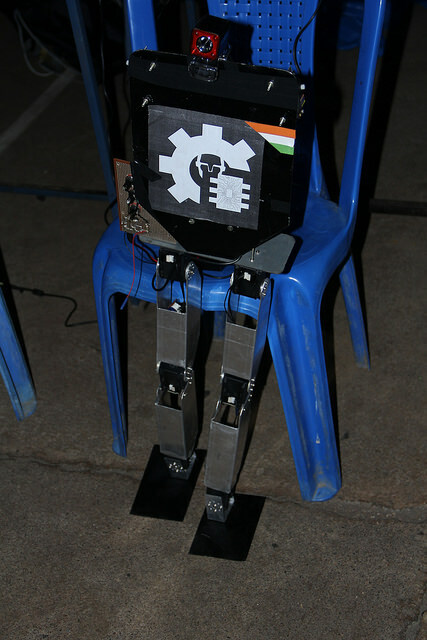 It’s the joyful season of Techno-Summit in our university. The only time in the year students get to bunk classes officially. 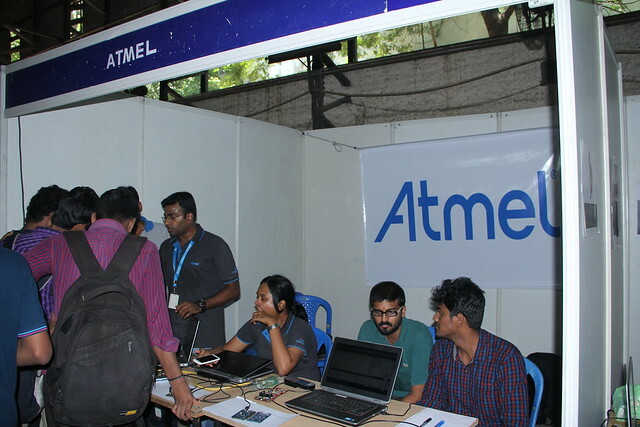 Techno-Summit is a 3 day’s technical symposium, wherein lot students from various colleges come in and participate in various events and workshops. 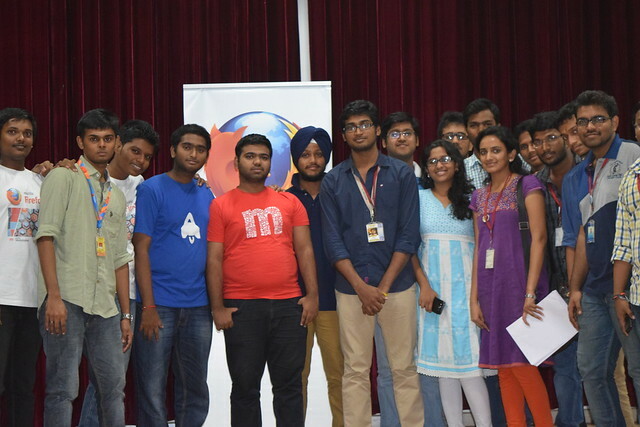 We the students of Sathyabama Firefox Club had organized one such workshop “Localization” with a limited entry, restricting to 50 students for each language(Hindi,Telugu, Tamil). The Computer Science Department of our university is a 3 storied building, with 3 labs in each floor. 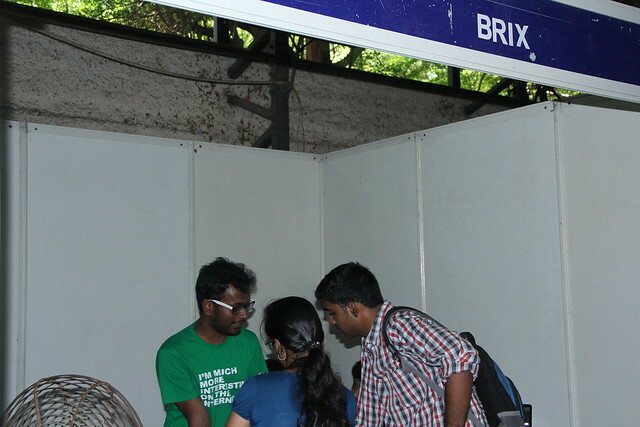 Eventually the registration desk was really jam-packed with all the registration in-charges completely occupied with the students and helping them in registering. 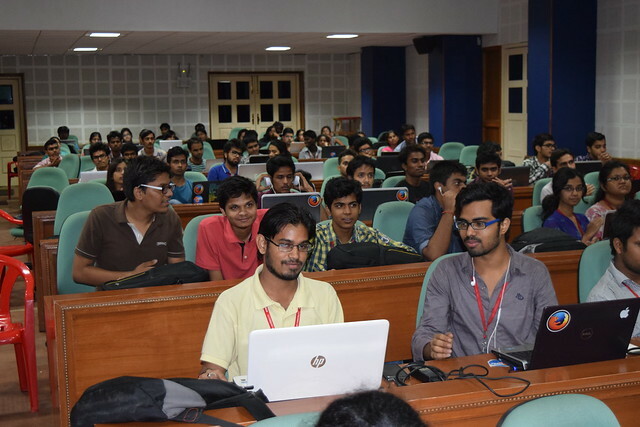 Since the seats were limited we received a nice response from the students who were interested in contributing to Mozilla with Localization and very soon we started with the sessions. 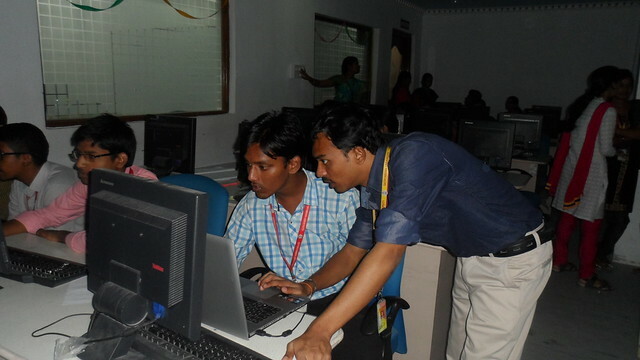 The Ground Floor Lab was taken over by Dyvik Chenna one of the leading experts and a top contributor towards Telugu Localization and he was accompanied by Nikhil Patel who is also a leading contributor and an enthusiastic App-Maker and is pursuing his degree from our very own college. 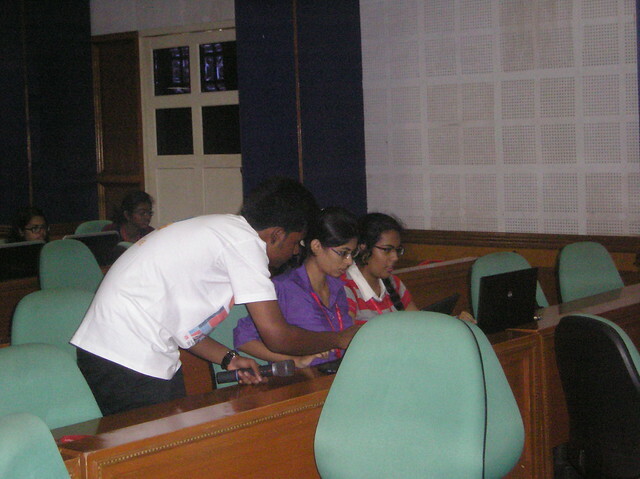 The entire session was made so power-packed by our contributors. They made students learn Localization by playing games. As they say “Knowledge which you discover with zeal, can’t be forgotten over a lifetime”, and that’s exactly what they did to make the session fun and active. 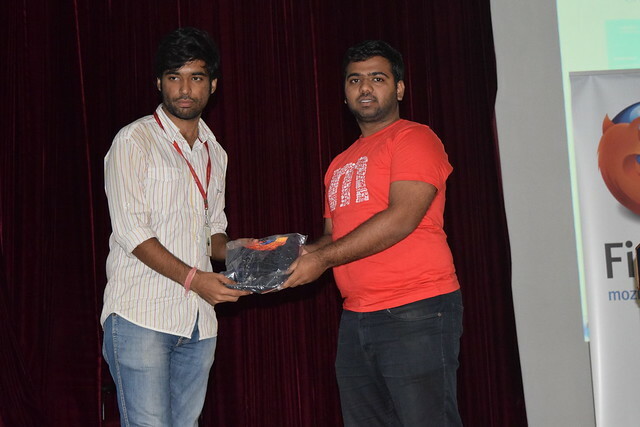 We also had our two FSA’S (Subhash and Bharath) who helped the students with their difficulties. Heading over to the next floor, here the session was taken over by Arun Prakash one among the experts in Tamil Localization who resides in Tamil Nadu. The students were taught a lot of new things about Localization which they didn’t know earlier. 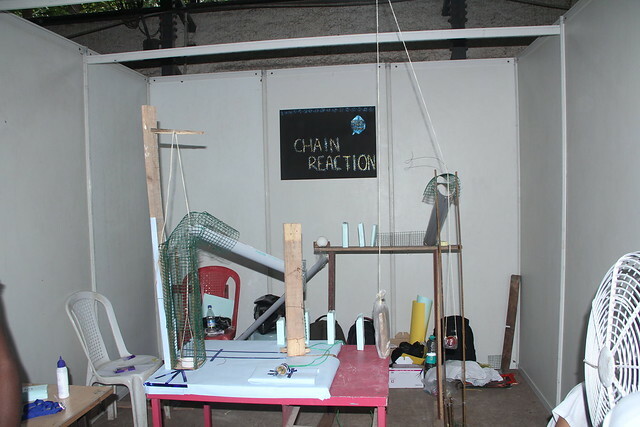 Moving to the 2nd floor, here the lab was occupied by Rajesh Ranjan and Chandrakanth Dhutadmal. 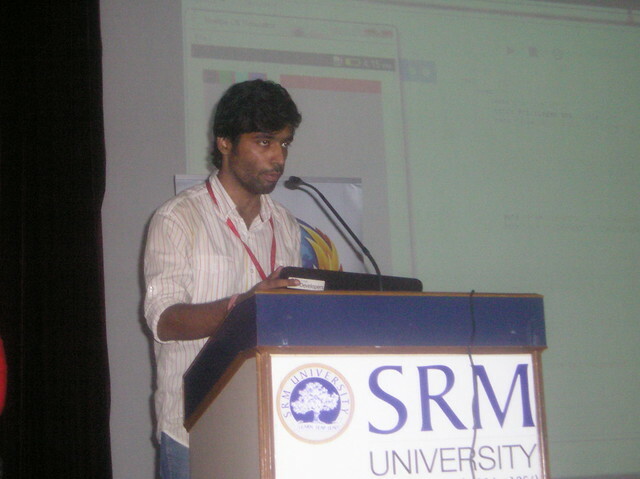 Chandrakanth Dhutadmal – he is a post graduate in computer engineering from university of Pune. 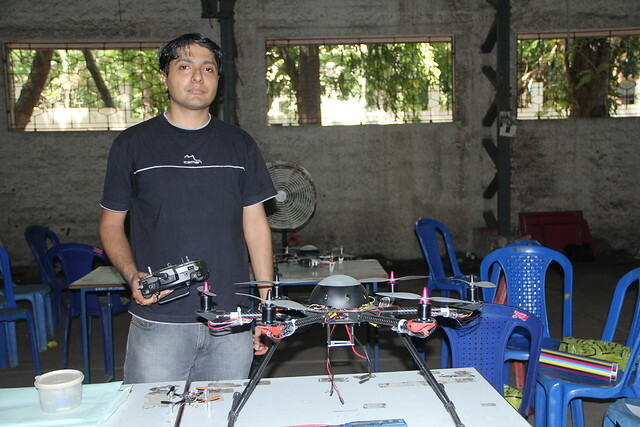 Starting his career as a University of Pune approved faculty in computer engineering stream, he served various engineering colleges for a period of five years before joining Centre for development of advanced computing (C-DAC) in January, 2006 as Member Technical Staff. Currently he is working as Senior Technical officer, in Graphics and Intelligence based scripting technology (GIST) group of C-DAC. His specialization includes Localization and Internationalization, Project Management, Software and Quality Engineering and is currently working on various research projects of State and National importance. He is a Certified Localization Professional (CLP Level 1) from The Institute of Localization Professional (TILP) since 2010 and Distinction holder in online certification course in eGov of Govt. of Maharashtra. 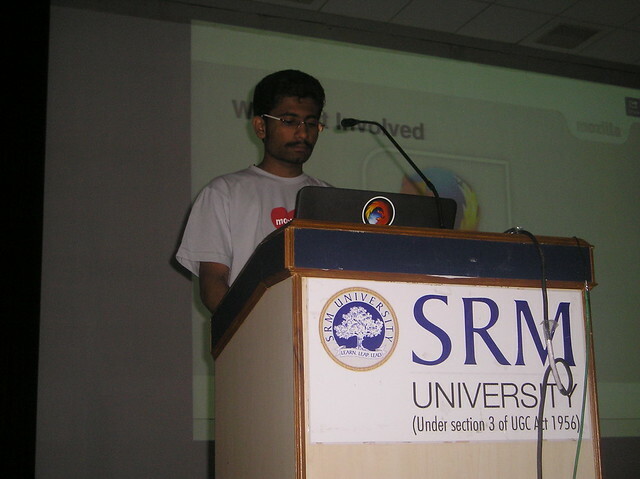 He is also active member of free and open source projects like “Mozilla Firefox” and “FUEL” project. During his tenure at C-DAC, Mr. Dhutadmal has been instrumental in getting and executing various projects like www.marathivishwakosh.com and others from state govt. He has participated in various National and International events like elitex, agis , “16th Annual LRC Internationalisation & Localisation Conference” in Limerick, Ireland and “Hindi World Conference” at Johanesburg, South Africa. 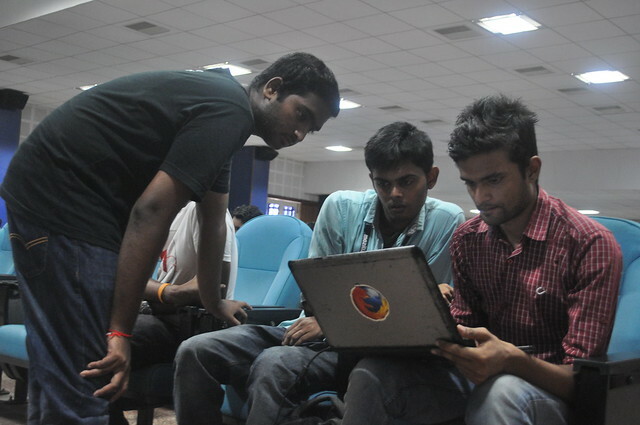 Both the contributors thought all the students on how to contribute to Mozilla via Localization. The students were really keen and interested. 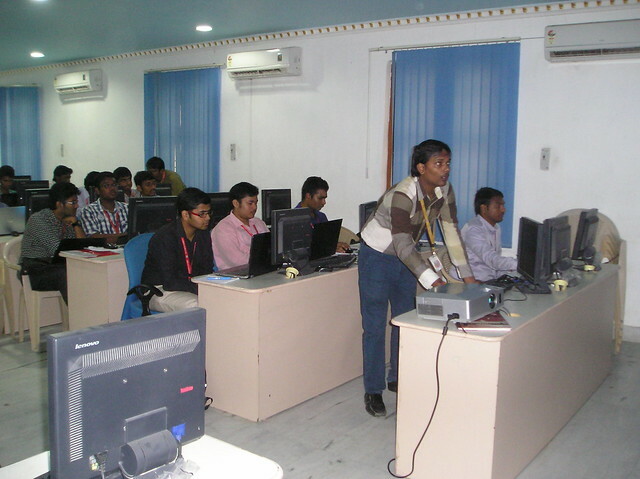 All the students requested them to conduct a hands-on session too. 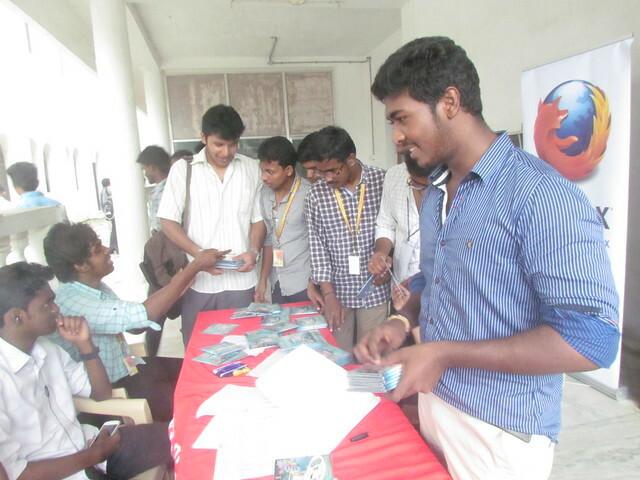 After which all the students were give some cool Mozilla swags which delighted them a lot. 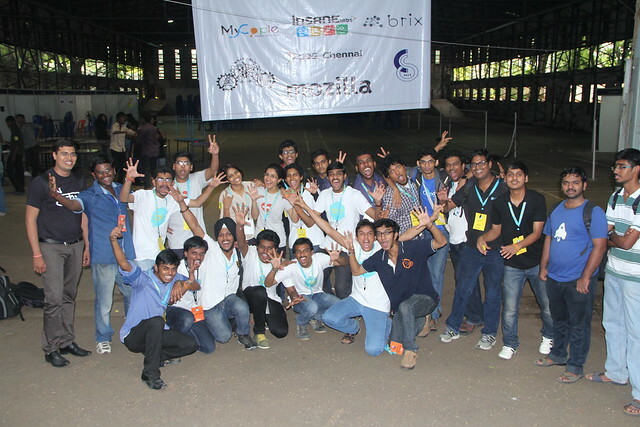 A super awesome click with the Hindi Contributors. 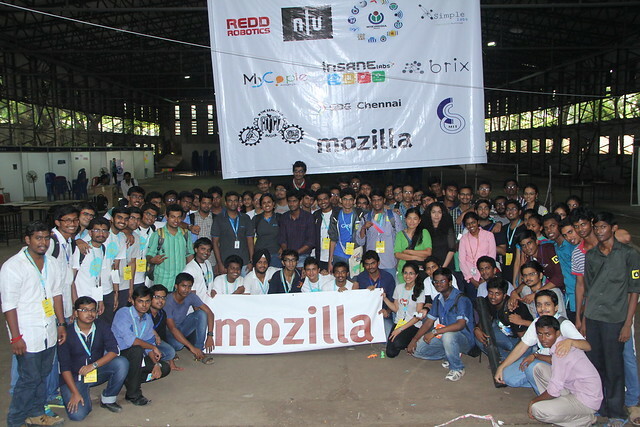 Once all the sessions were over in all the floors it was time for a group picture with all the Localizers and Firefox Student Ambassadors. “You can’t cross the sea merely by standing and staring at the water.” In order to reach and fulfill your goal there are a lot of up’s and down’s in one’s life. 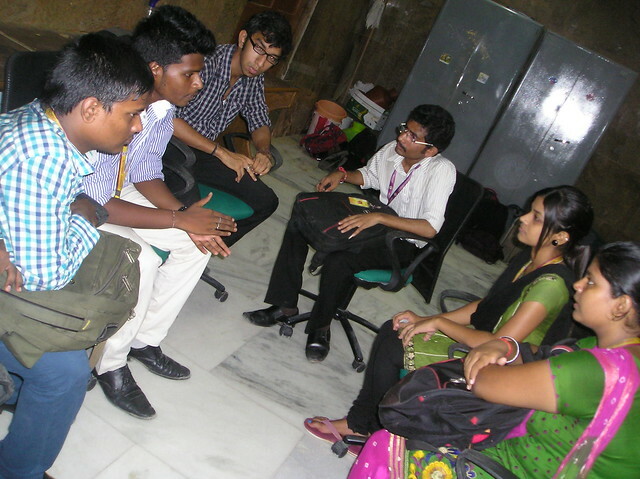 It all starts on a Friday evening when we are all set with our backpacks to reach our venue “SRM University”. 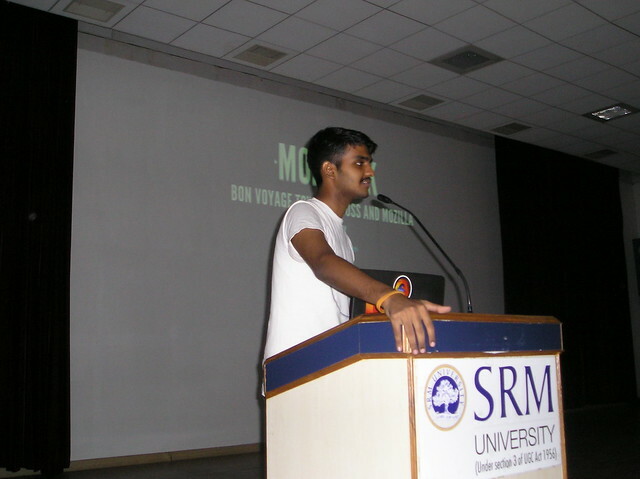 SRM University in one among the renowned University’s in and around TamilNadu, and “Aarush” is a National Level Technical Symposium organized by the University wherein students from 100+ college’s come to attend it. 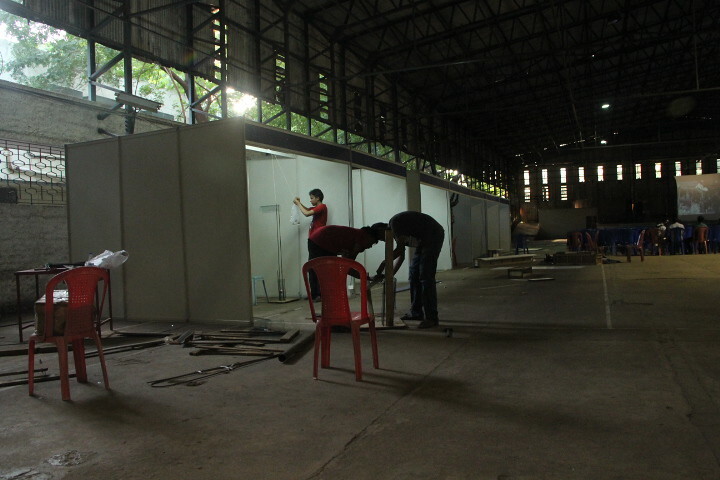 This was the venue set for our event and the event was conducted for 2 day’s (Saturday & Sunday). It’s not easy to accomplish your goals in life was well said, since as soon as I stepped out of my house I saw black clouds over my head with intense breeze. As I was on my way to the bus-junction it started raining cats and dogs. By the time I got into the bus I was completely soaked to the skin and yes the crowd in the bus reminded me of my native city “Mumbai” wherein to board a train you probably just need to stand a few meters away from the train, and the potency of the mob is adequate to get you in and out of the train. By 9:30 in the night Subhash and Myself reached the station where we met Nikhil and Shashank. As it was time for dinner we were on our way to the nearest restaurant where we met our 2 passionate Reps Naresh & Vishwa. 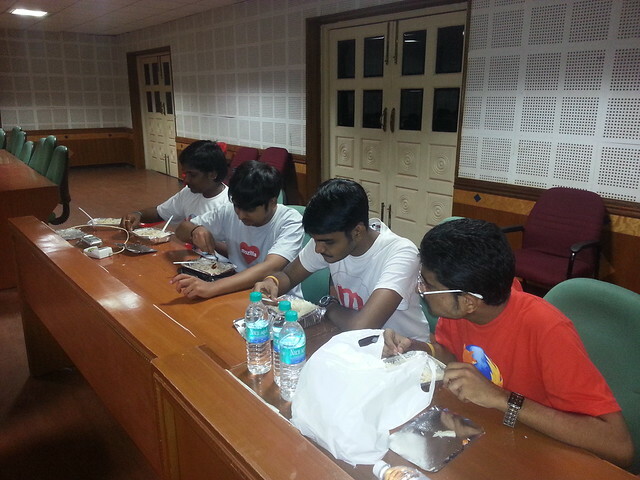 As soon as we finished our dinner the Organizing Committee of Aarush’14 from SRM University were there to pick us up and drop to the boarding house where we could stay for the night. Once we reached the room, the agenda for the next day’s event was planned till late midnight. The workload was split up equally with everyone. After a frosty night’s snooze, the morning was bright and cheerful. We reached the auditorium 10 minutes prior to the event, so that we get adjusted to the atmosphere and all that astonished me was a massive crowd waiting for the session to start enthusiastically. 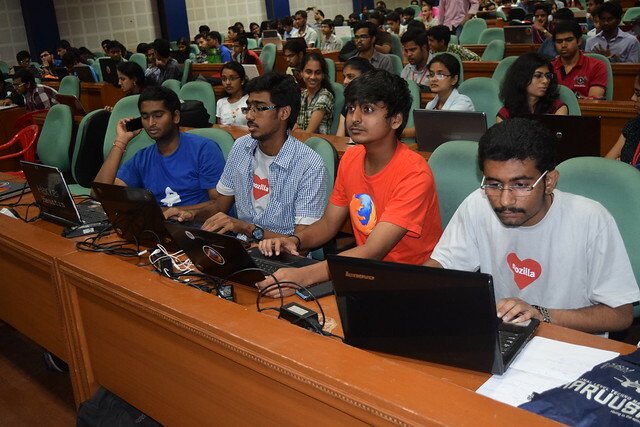 Since there were nearly 400+ students it wasn’t feasible to accommodate everyone in a single lecture theater hence we decided to split them in two different hall’s and each auditorium would be handled by 5 Mozillian’s in chorus. 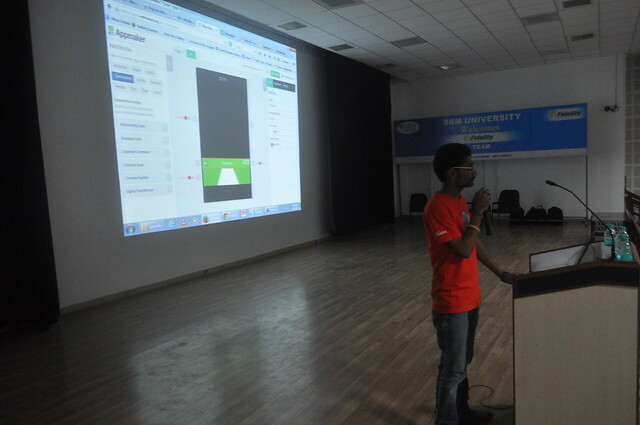 The first session was handled by Shashank(Webmaker Super Mentor) and Franklin(Myself) wherein we played a quick Spectrogram to wake the crowd up. 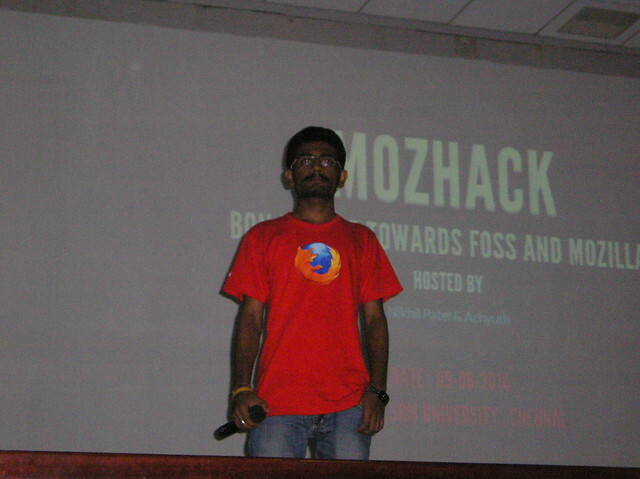 Later we told them what FOSS is all about, and the difference between FOSS over Proprietary software. 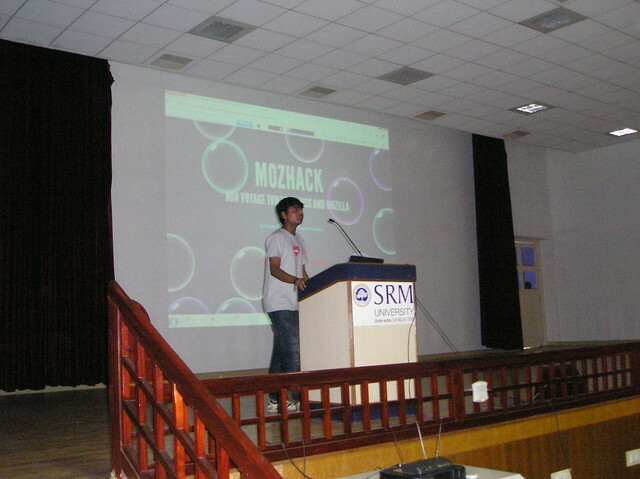 Up next we listed out all the products of Mozilla and kicked-off with the Webmaker session. 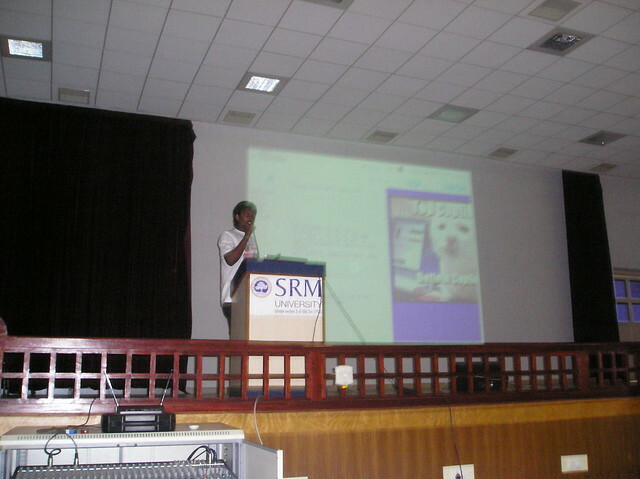 Shashank then explained the students about X-Ray Goggles & Popcorn maker, everyone were much interested in it since one can modify a page without knowing much of HTML. 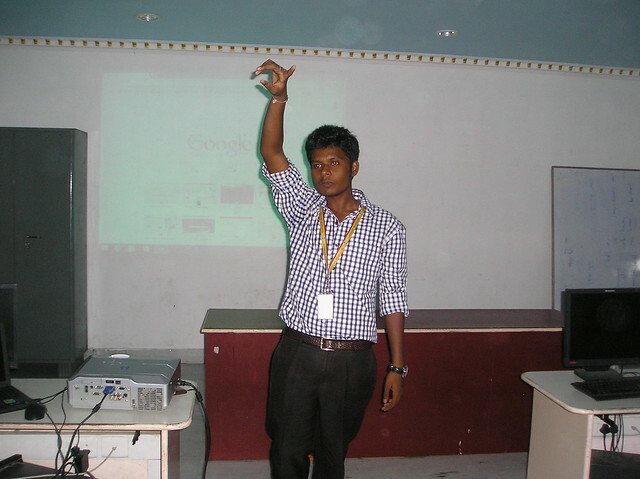 Next I took over a session on Thimble, before which I asked the students if their familiar with HTML & CSS for which I got a lot of hands-up. 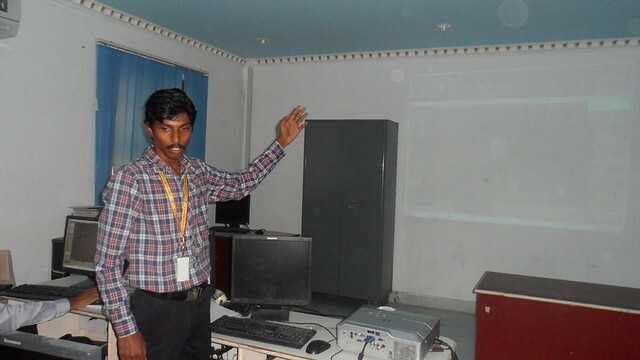 While I was explaining about Thimble and it’s uses a live demonstration was shown by Subhash on the projector screen. Once we all 3 were done explaining it was now time for the students to start creating their “makes”. 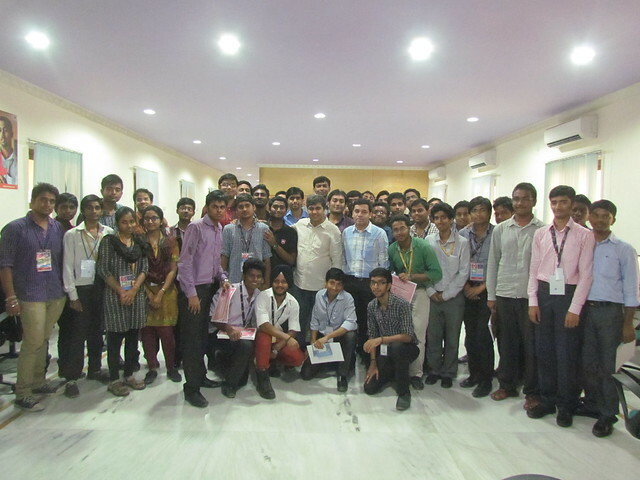 Lot of students had doubts which were clarified with ease by Shashank, Subhash and Myself. 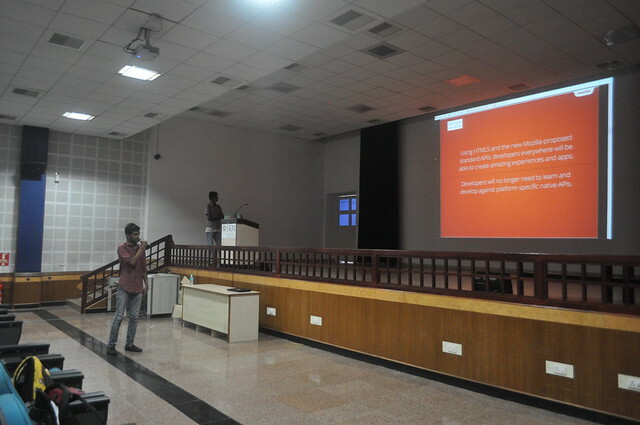 Simultaneously in the other hall Achyuth and Nikhil warmed up the students by starting off with the Spectrogram. 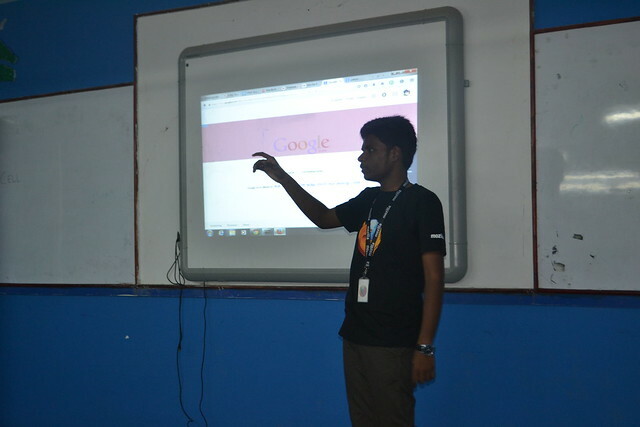 Later on Nikhil was explaining about FOSS to the students while Achyuth was briefing about Mozilla and its products and the numerous ways by which one can contribute to Mozilla. 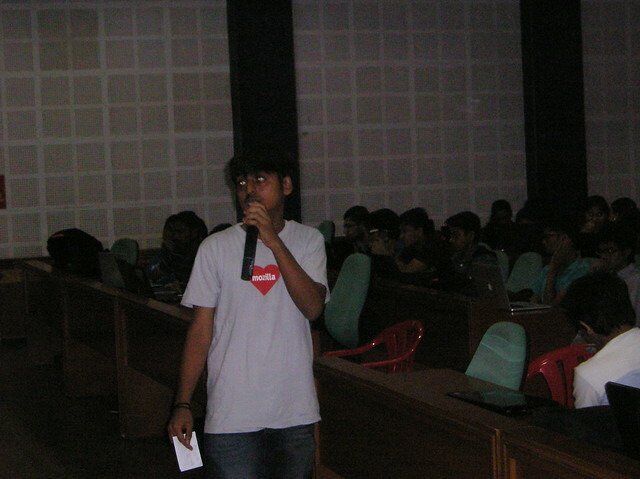 Next Achyuth was explaining the various Webmaker tools and how each tool is different from the other. 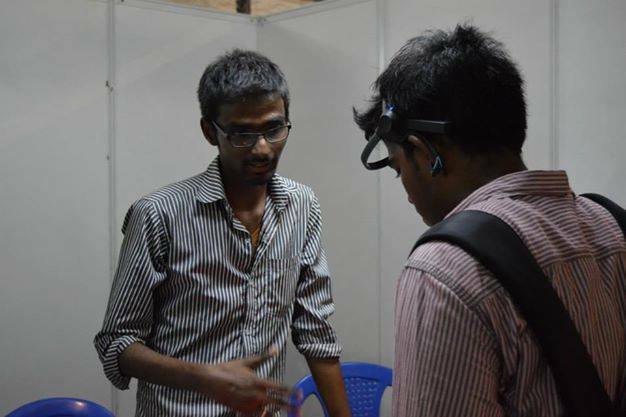 Later a Hands-On session took place wherein all the students tried each tool and were lost in trance experimenting with them. 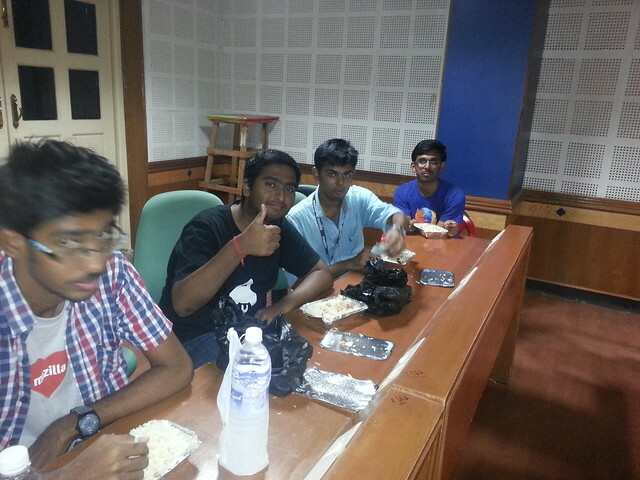 By now it was time for lunch and all the students had dispersed for lunch. 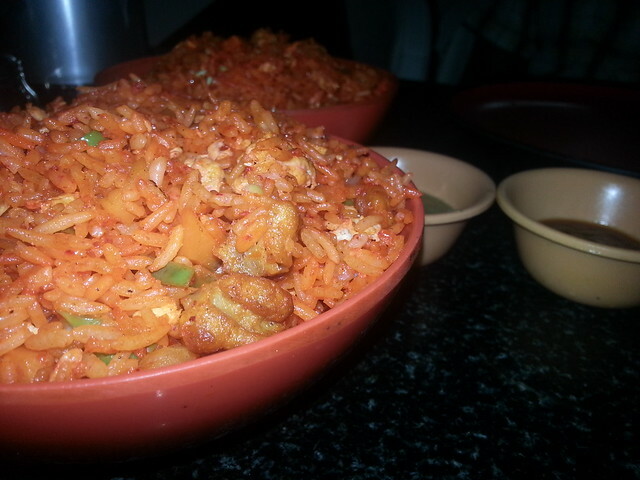 Once we were over and done with our lunch everyone became energetic again and were back to work. 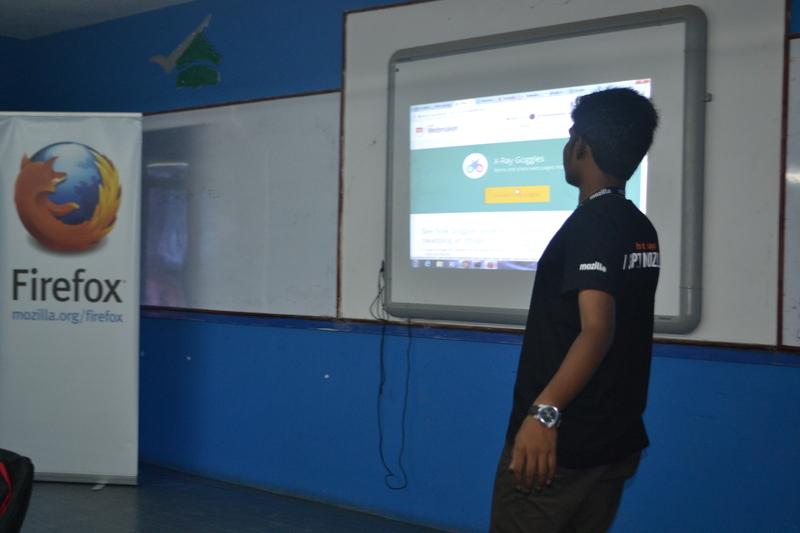 Then Vishwa (Rep) explained the students about Appmaker, the students were keen to understand the concept since there was not much of coding and developing an app without coding is what everyone basically likes. 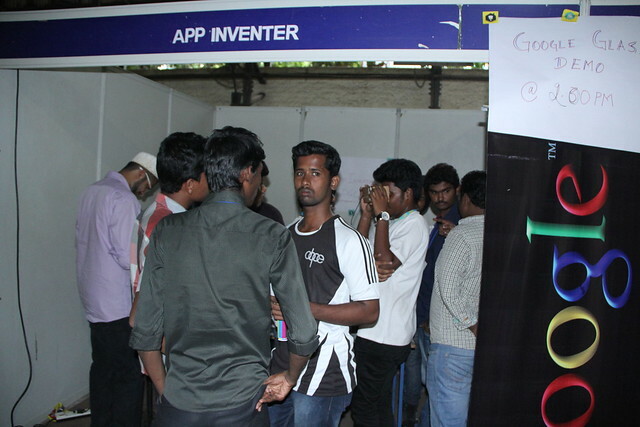 Later on there was a Hands-On session on Appmaker. 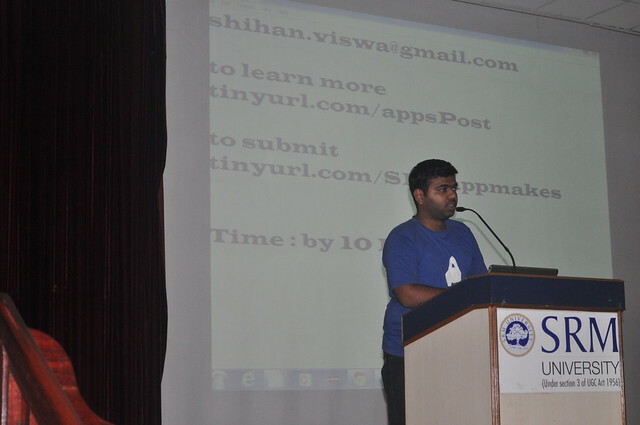 Up next Vishwa explained about Advanced Appmaker wherein he told the students about WebIDE and other useful stuffs. 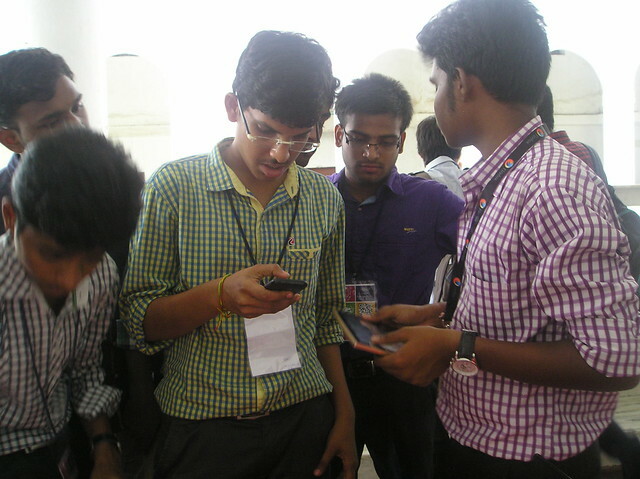 In the other hall Nikhil was explaining about Appmaker to the students and shared the same common information. 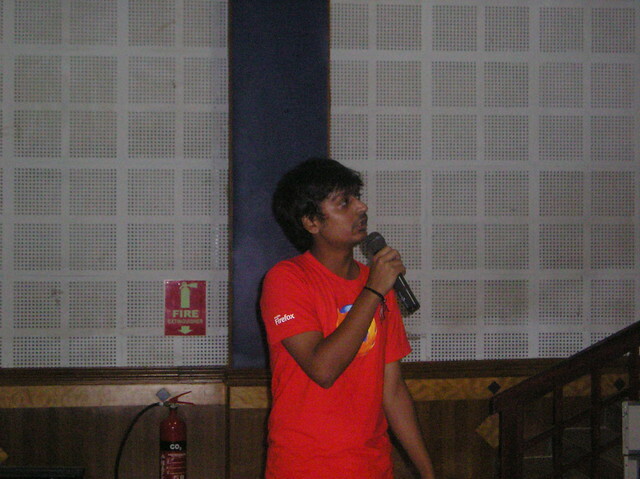 Then the next session was taken over by Sachin Singh who gave who gave an highly structured explanation on Firefox OS. By then we came to the end of the session for the day and all the Mozillian’s were busy clarifying doubts which the student’s had. 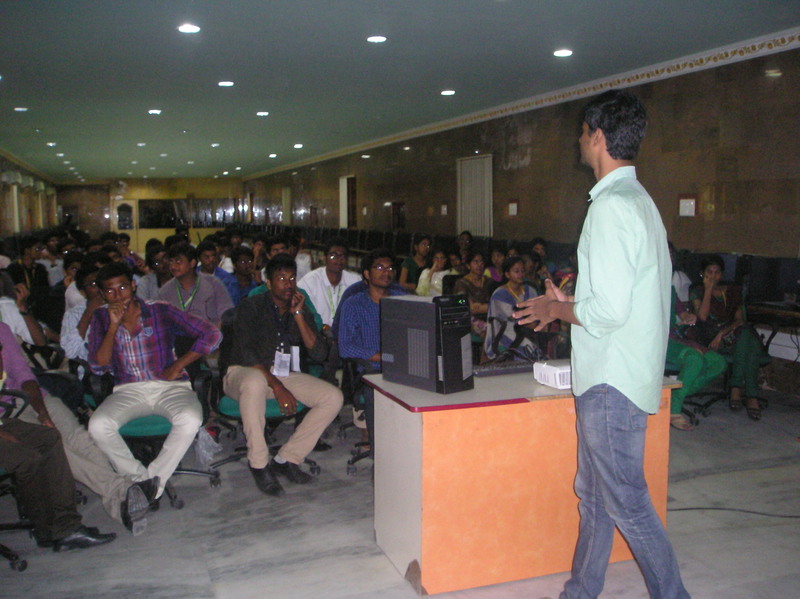 Today the students were much more excited then yesterday to know much more about Mozilla and the ways through which they can contribute. 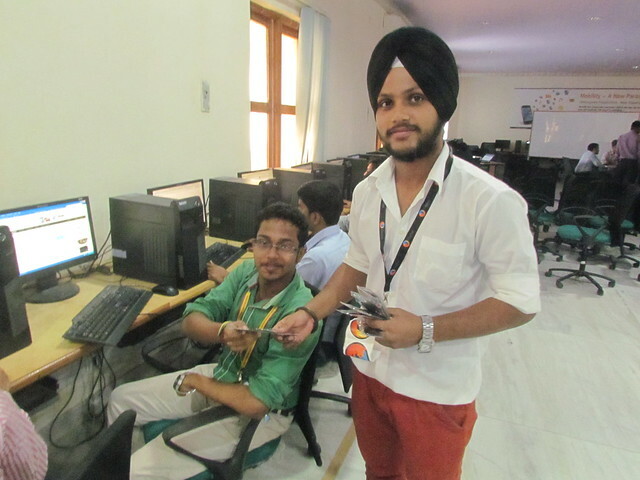 To brighten the day Shashank and Nikhil explained about WoMoz and its reason for formation as a club. 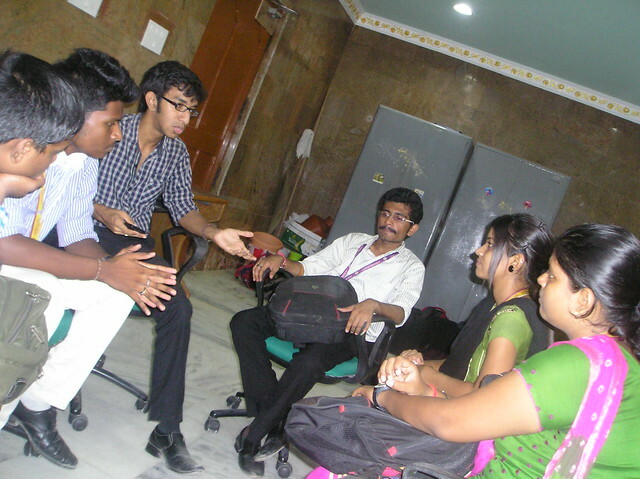 After which Jerald was explaining about “KidZilla” an initiative started by all of us as a club. 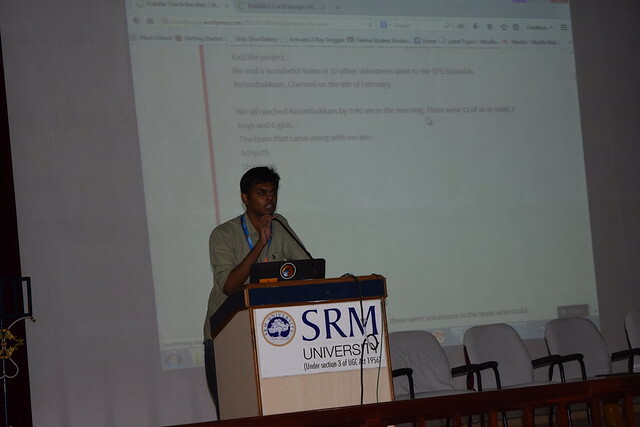 While all of this was happening in the auditorium, Naresh created a Google Form Link and shared it with all the students wherein students can fill in their Name E-Mail ID and the link linking to their Appmakes and Webmakes. Concurrently back stage Vishwa, Naresh & Nikhil were reviewing all the Apps, besides Achyuth, Shashank & Myself were reviewing all the Webmakes. Though it was virtually impossible for us to select the finest, we decided to go along with 3 winners. 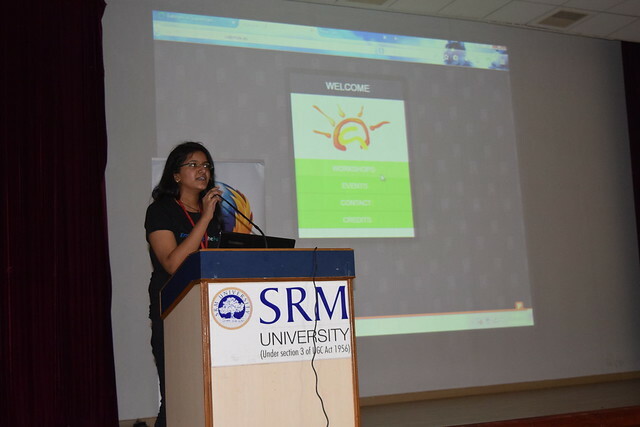 Finally we come to the end of a marvelous overwhelming 2 day’s Hackathon event at SRM university. And as they all say, there is no occasion successfully complete without this one! 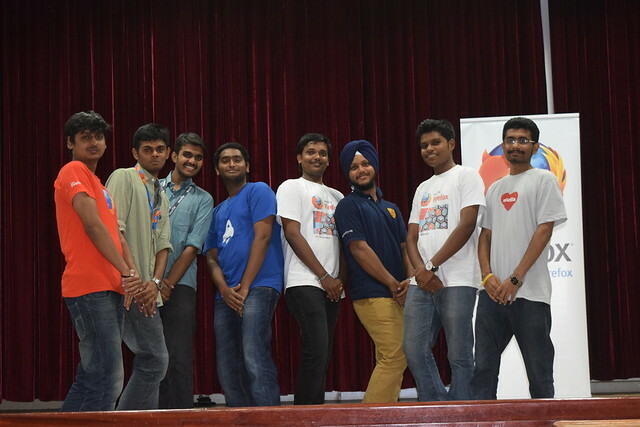 So all hail for #thedaminipose !! Pictures describe more than what words do!